Seemingly everything in this gulch, if it isn’t named silver this or silver that, is named argentine something. That doesn’t refer to the South American country, which one could easily think considering the creek on the other side of Argentine Pass is named Peru. Argentine is Latin for silver. The element Ag in your chemistry class. So there you go. This is where silver was discovered in Colorado over 100 years ago. We’re up early this morning for trailhead coffee but skip the regular oatmeal. We’re hoping to find something open in Silver Plume. We drop down from Pavilion Point along three miles of the most perfect, picturesque running trail imaginable. The sides are lined with golden yellow and burning orange Aspen. The trail is buried in fallen leaves. The dirt is soft and the grade smooth because 100 years earlier it provided footing for a silver mine train. After the mines closed, the train carried tourists to McClellan Mountain. So many of the trails today in Colorado were once the routes to work for miners. This morning’s hike feels anti-climatic. 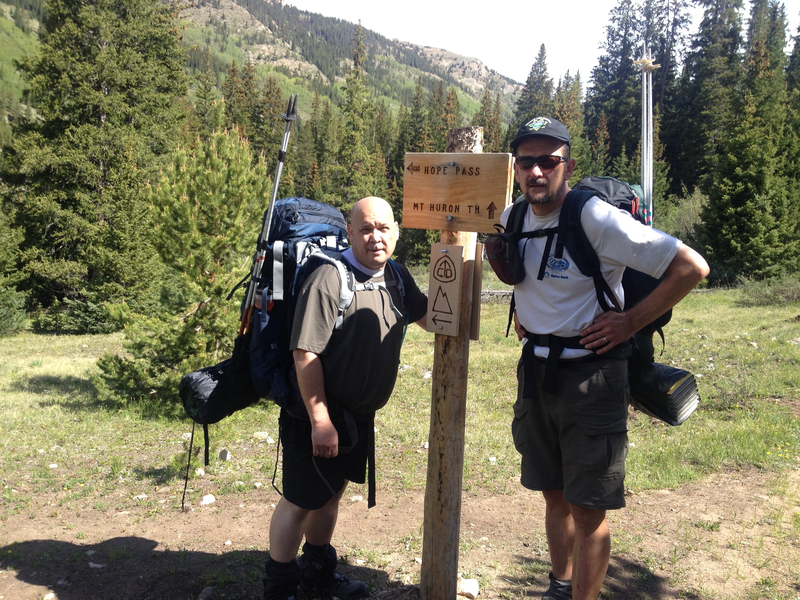 This is our third official day on the trail but we’re coming down from the Continental Divide. 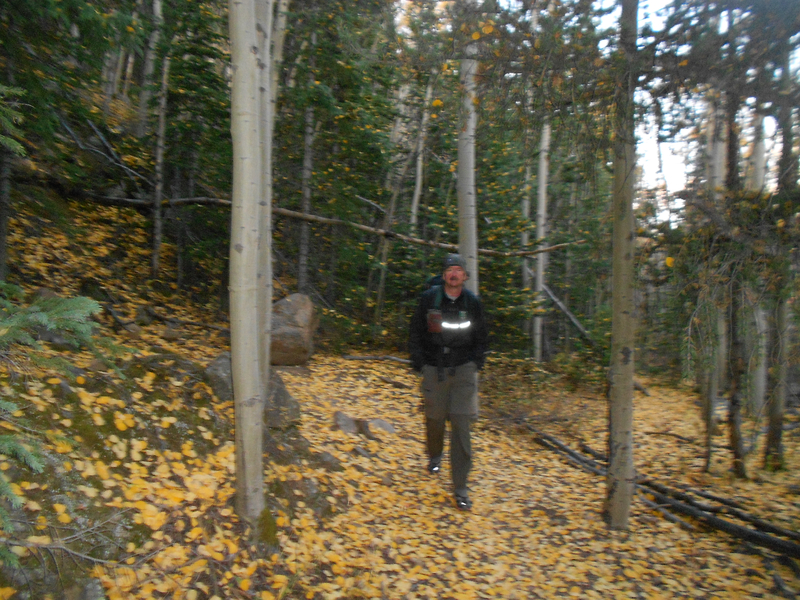 Could be I find these Aspen trees so spectacular because I’ve been above treeline for the last two days. Yesterday’s scrambling across a knife edge continues to thrill my memories. I tell La Plata I want to complete that ridge with him when he returns. The trail bottoms out in Silver Plume at exit 226. That suggests we have a five mile walk to Bakerville. That’s fine, it will be easy hiking at relatively low altitude. We enter the sleepy town looking for anything open. La Plata queries a garage mechanic for water while I encounter a hotel proprietor and engage her in a conversation. This pleasant lady owns the Windsor Hotel B&B and instructs me to turn right on Main Street in search of the best bakery ever. George and I recover La Plata from the garage and we walk down Main Street. We don’t find the bakery (maybe she said turn left) but discover the Silver Plume Tea Room instead. They are closed for a party but forgot to lock the door and we wander in. They graciously feed us thinking we might be gone before their brunch party begins. Their food is incredible. I have waffles with walnuts and drink copious amounts of flavorful coffee. We take turns resupplying our camelbaks with water from their restroom, and leave after having pie for desert. We hike the service road to the Bakerville exit, leaving just three miles to our truck parked up a steep jeep road at the Gray’s Trailhead. La Plata and I leave our backpacks with George at the overflow parking lot to make a quick run up to our truck. We estimate we can manage a 2 mph pace if we don’t stop. That will get us there in 90 minutes. Instead, we get competitive and race up in 44 minutes. A 4 mph pace. A totally satisfying way to end our three days on the trail. 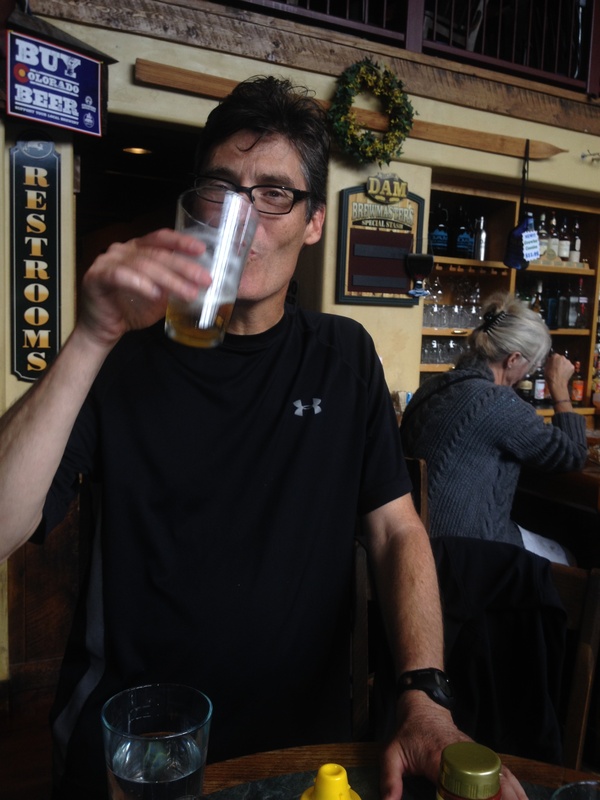 Next, we pick up La Plata’s truck and quaff some beers and lunch at the Breckenridge Brewery. After, I drop George off at DIA and head home to finish the weekend with family. 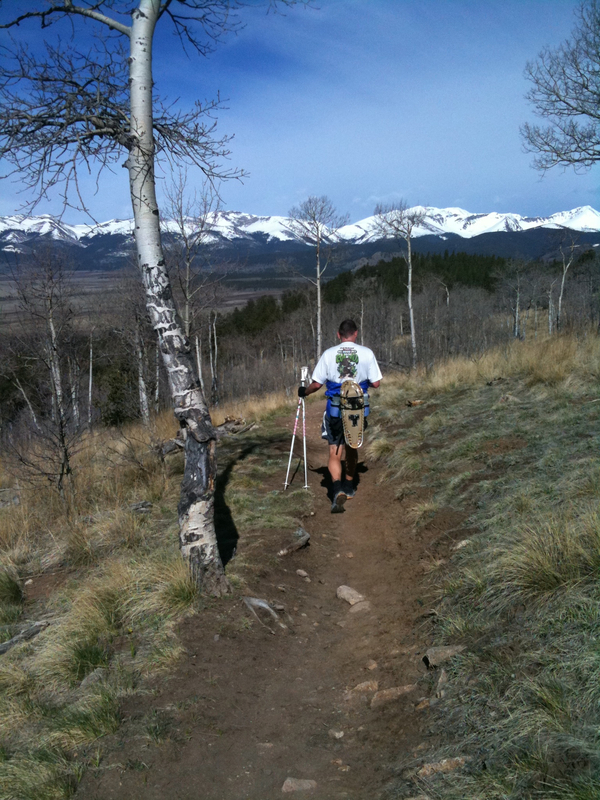 Backpacking might not be the most logical weekend training regimen to prepare for the Denver Marathon. I sort of think it is. My legs are exhausted. I’ll know for sure in a few weeks. I take a half day Thursday, which at IBM somehow adds up to 5.5 hours. I rent a high clearance 4WD vehicle and pick up George from DIA. George is La Plata’s ole UT college buddy. He lives in Austin with his French wife Nathalie and two sons. 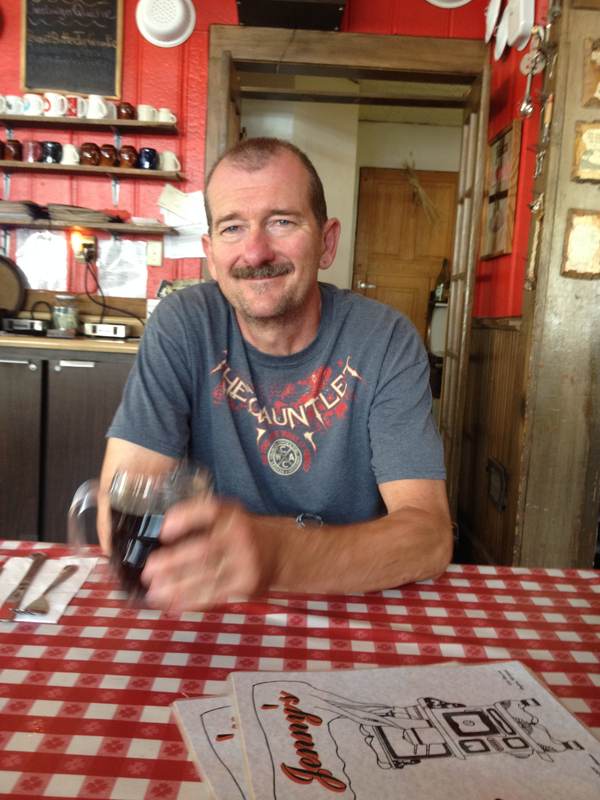 On our drive up to Summit County, I discover George, while soft-spoken, is an ex-Marine. He’ll be fine over the next few days. He’s prepped well with hikes in the Guadalupe Mountains. 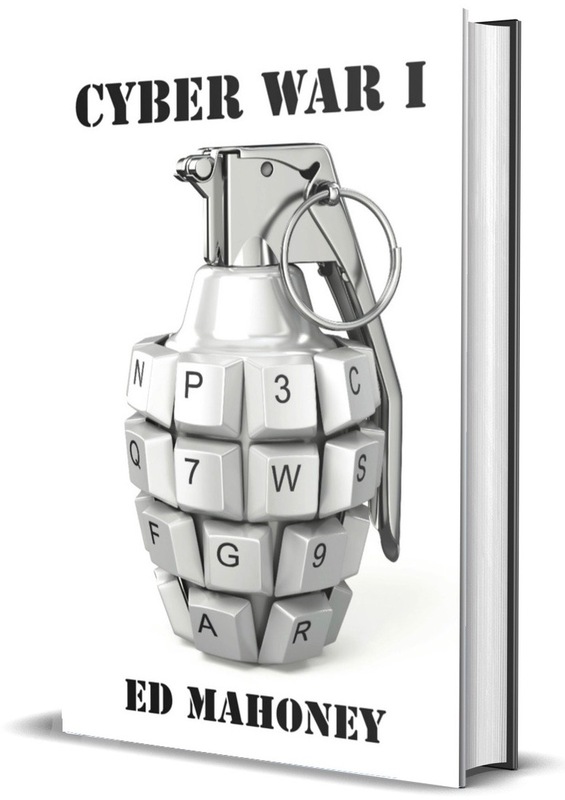 And George writes a great blog. Not sure how to describe the content. Mostly athletic oriented, but he’s a horizontal thinker who can mix up genres. 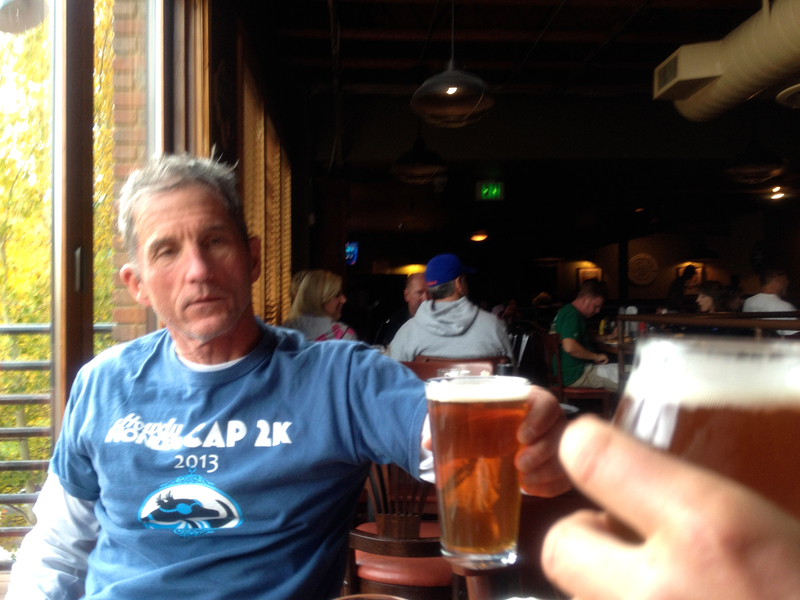 We meet up with La Plata at Empire Burgers in Breck. Afterward, we drive to the Georgia Pass trailhead to camp for the night. 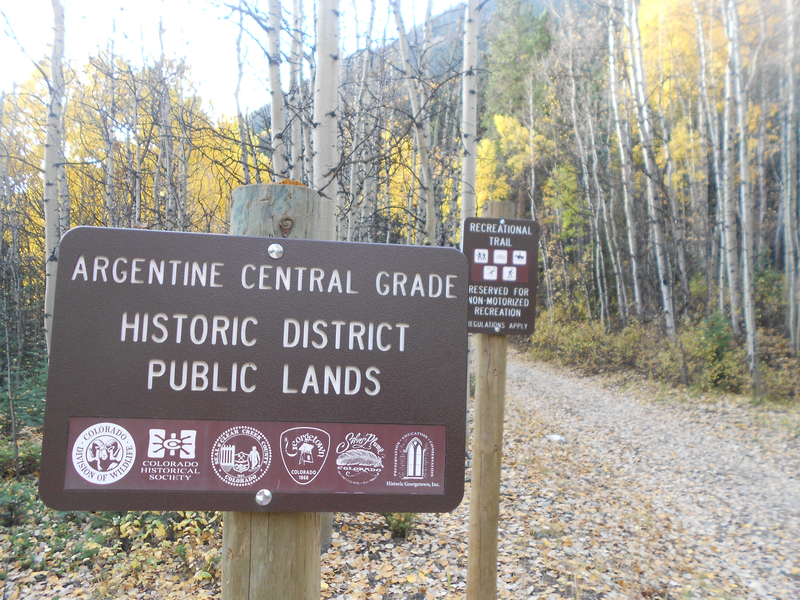 This trailhead is located on the Middle Fork of Tiger Road. We seem to forget this and drive up the South Fork of Tiger Road. 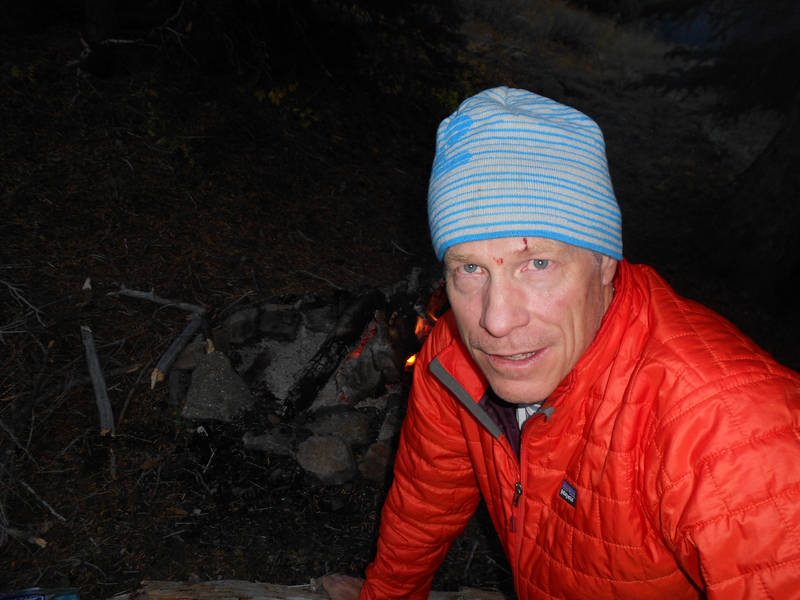 We spend a good hour searching for the trailhead in the dark, on a wicked 4WD jeep road. 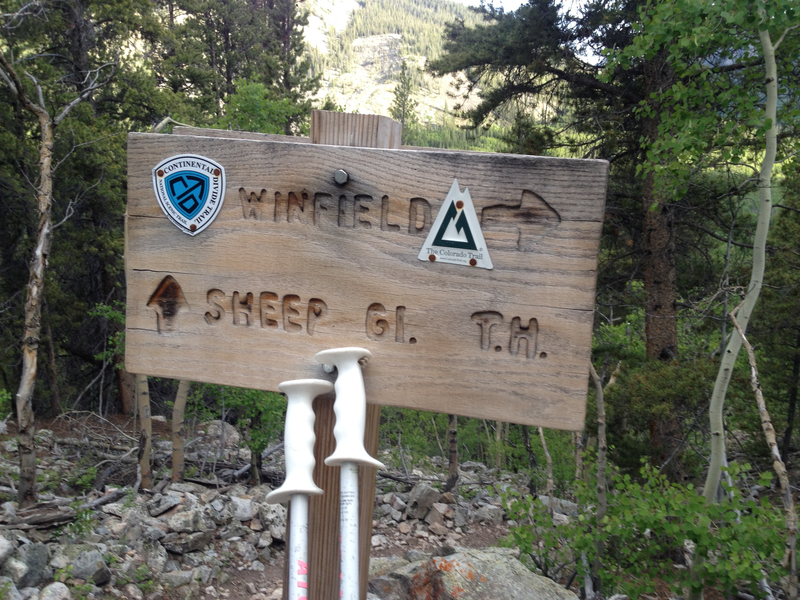 We finally determine to try the other trailhead we are familiar with. It would add three miles to our hike. Fortunately, this turns out to be the TH we were looking for to begin with. Issue is there are three forks to Tiger Road. North, Middle and South. The two THs to Georgia Pass on the Colorado Trail are on the North and Middle Forks, not the South Fork. Great camping spots on the Middle Fork. 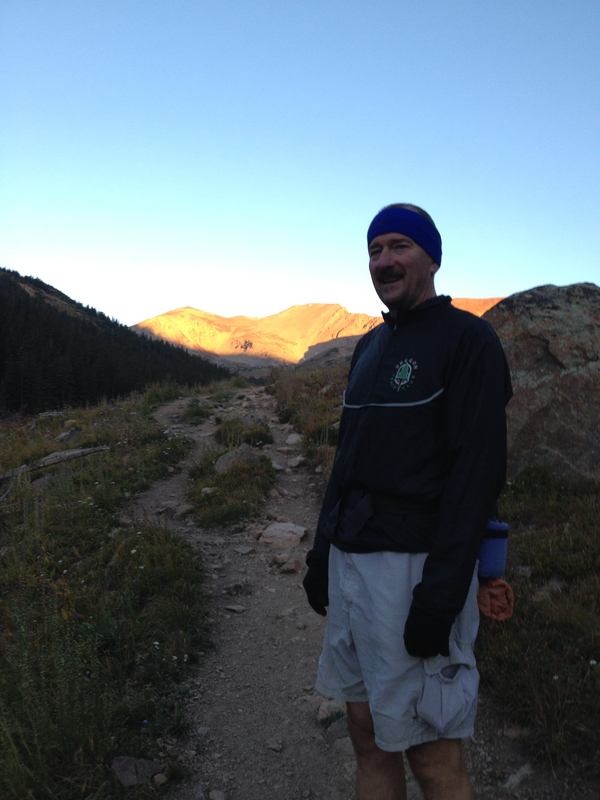 La Plata wakes us up before sunrise with trailhead coffee. We leave behind his truck and take mine into Frisco for breakfast. I forget the name of the place, but I have huevos rancheros and La Plata picks up the tab. Then George generously pays for my gas on the way out of town. 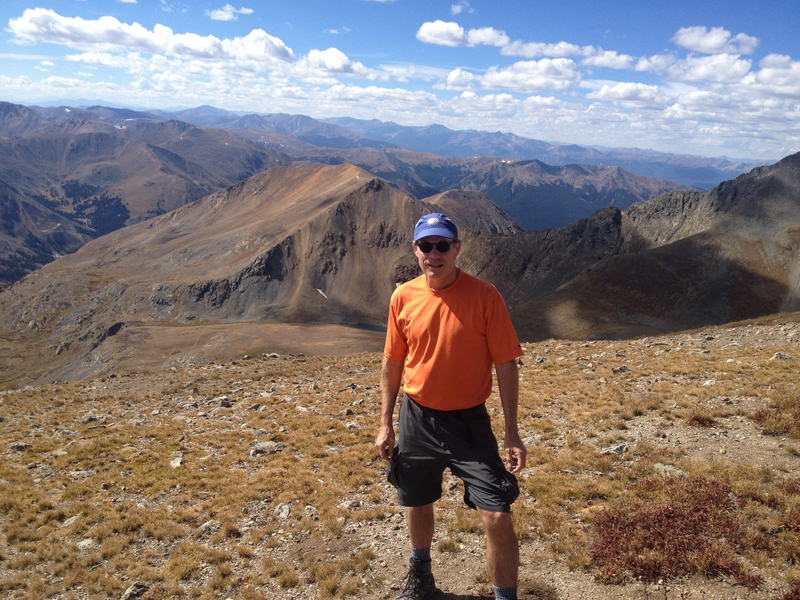 We drive back toward Denver, through the tunnel, and take the Bakerville exit 221, just a few miles east of Loveland Pass. There’s a large parking area here. I imagine it’s for the Grays Trailhead for people without 4WD, but could be overflow parking for the Loveland Pass Ski Area. There is a paved bike path from this lot all the way to Loveland Pass. I plan to bring my friends up here sometime to run it. We drive the dirt road up through Stevens Gulch to the trailhead. 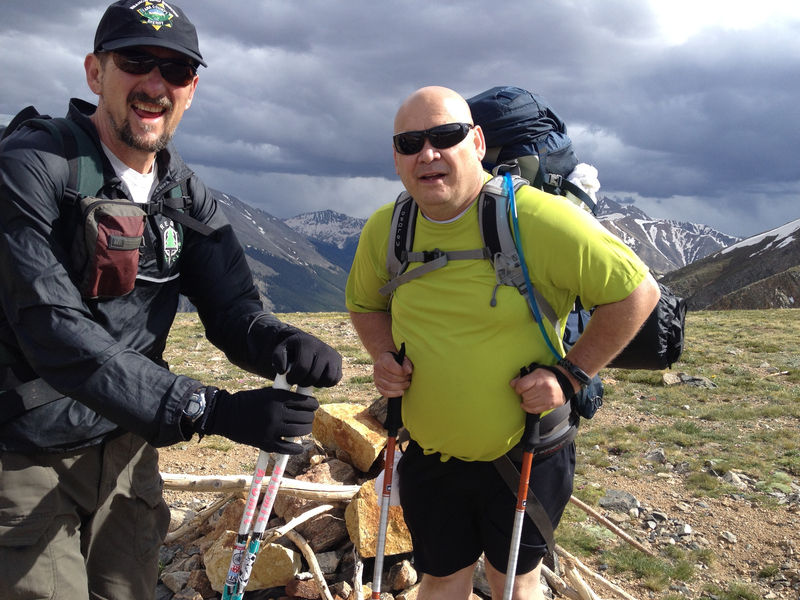 There are two popular 14ers accessible from this trailhead – Grays and Torreys. We snag the last available parking spot. Breakfast slowed us down and we don’t launch until nearly 9am. 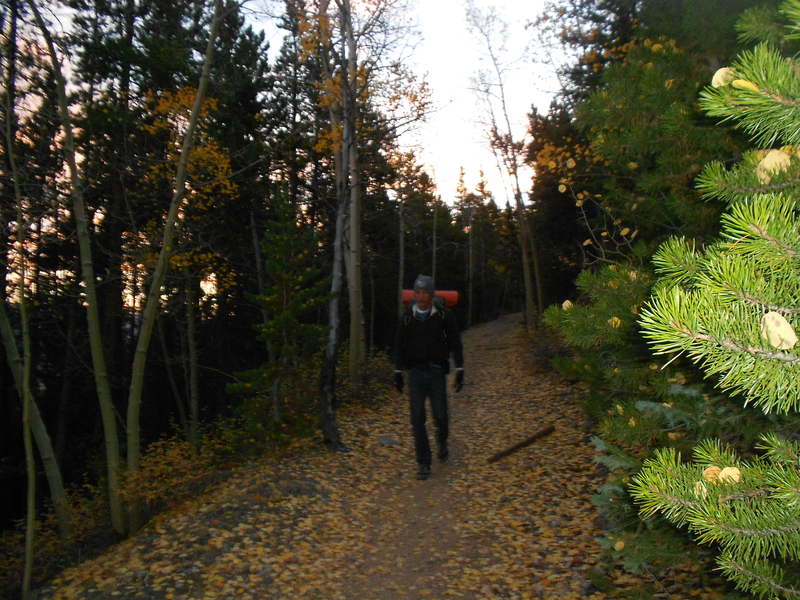 Unlike many trails, this one begins at treeline with a gentle grade. 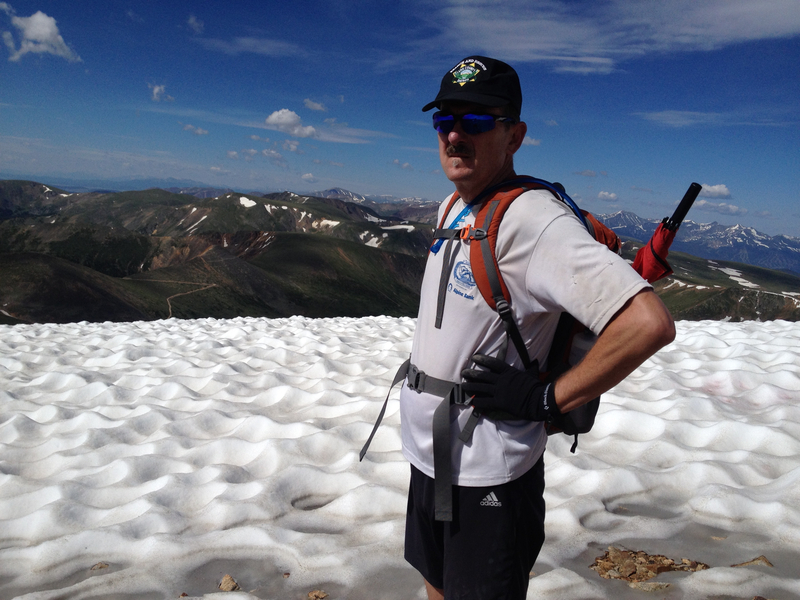 I imagine George appreciates the easy warmup as we intend to climb both 14ers – first Torreys, then Grays. And that’s what we do. 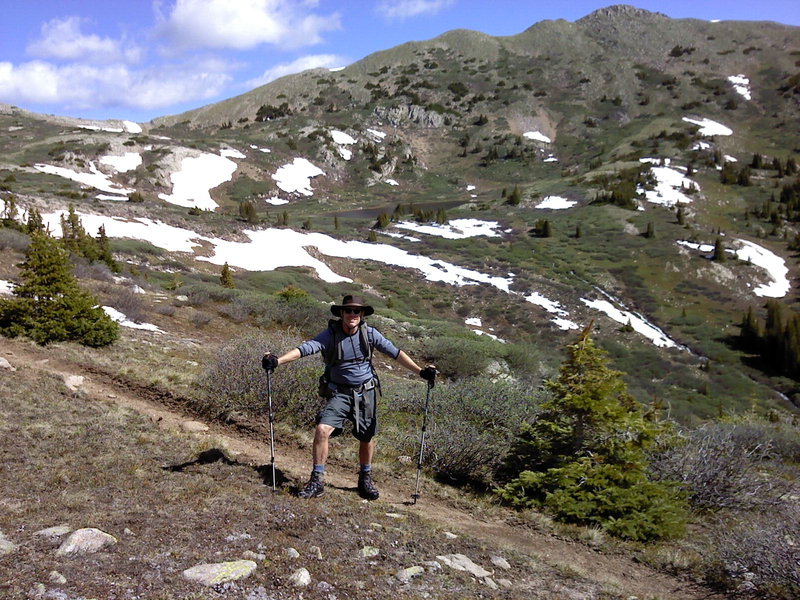 The trail leads up a few miles to a Y junction where the left leads to Grays and the right to Torreys. 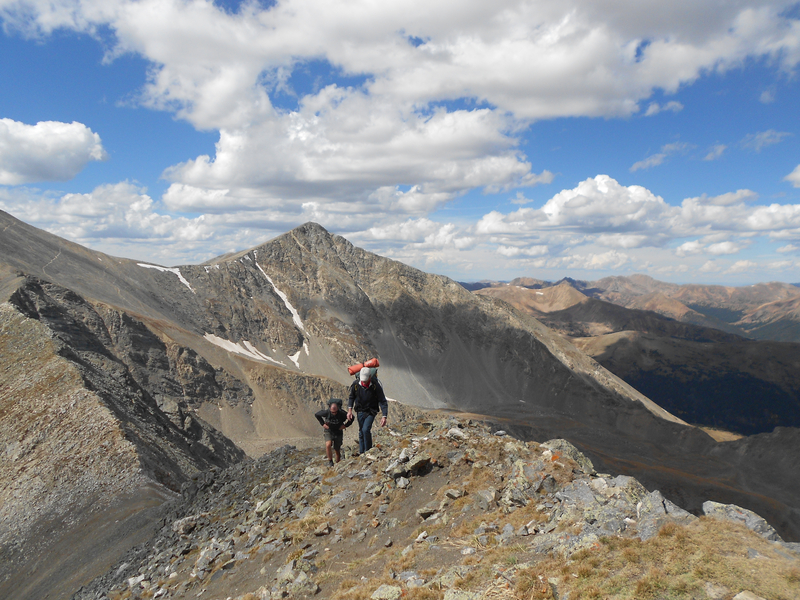 We hike toward Torreys because Grays is on the path we expect to continue on for the Continental Divide Trail. Both peaks are named for botanist colleagues of the botanist who first climbed these mountains in the late 1800s. 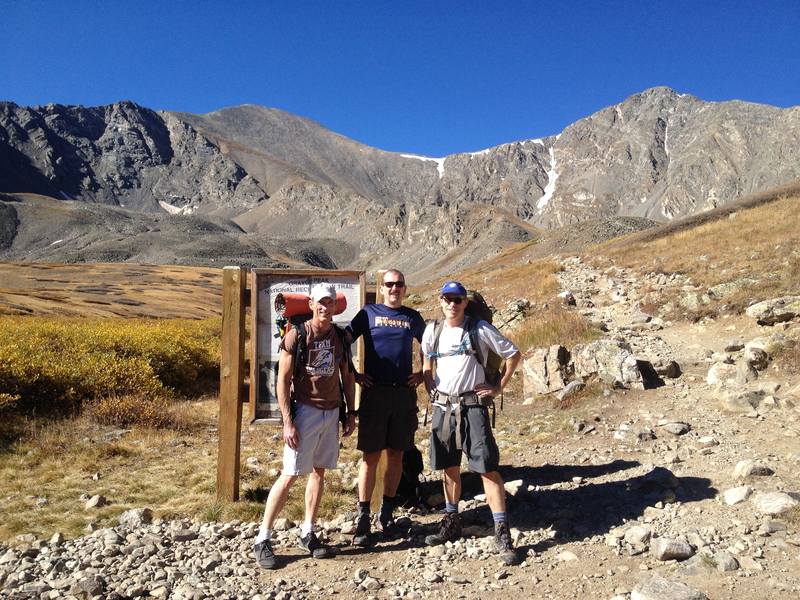 In the photo above with us three standing at the trailhead sign, Grays is on the left and Torreys on the right. Our branch of the trail reaches a massive cairn on the ridge between the two peaks. There is another option to turn toward a different approach up Grays. 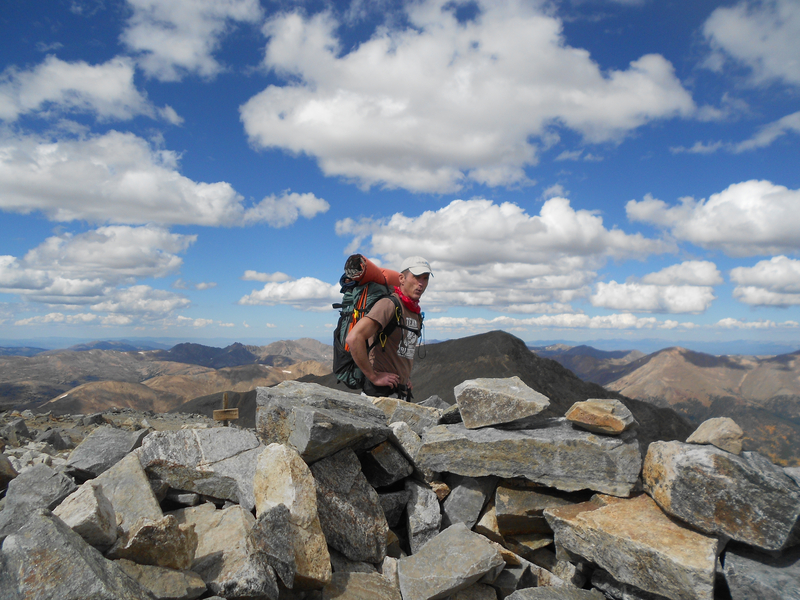 We smartly drop our 35 pound backpacks at the cairn before the half mile climb up Torreys. We expect a long day and need to conserve energy. 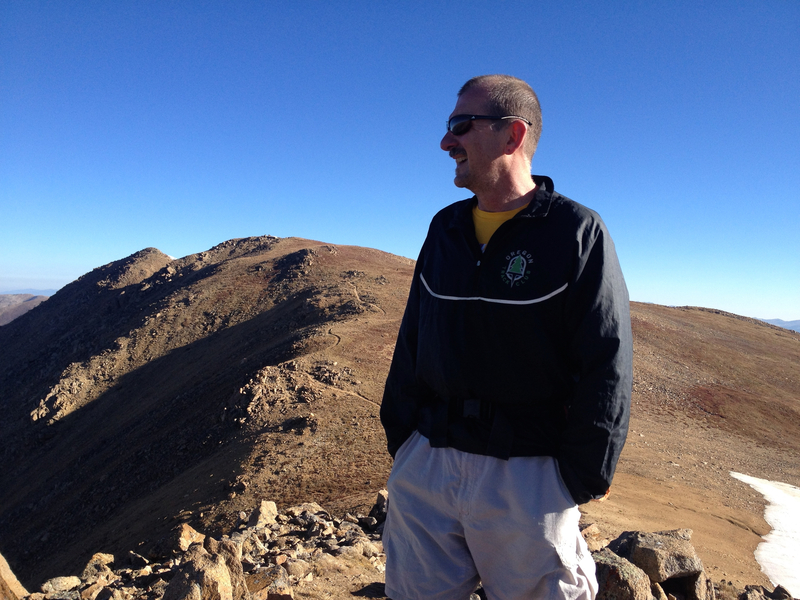 I find the views interesting atop the peak because I am so familiar with Summit County. The peak actually forms the border between Summit and Clear Creek counties. 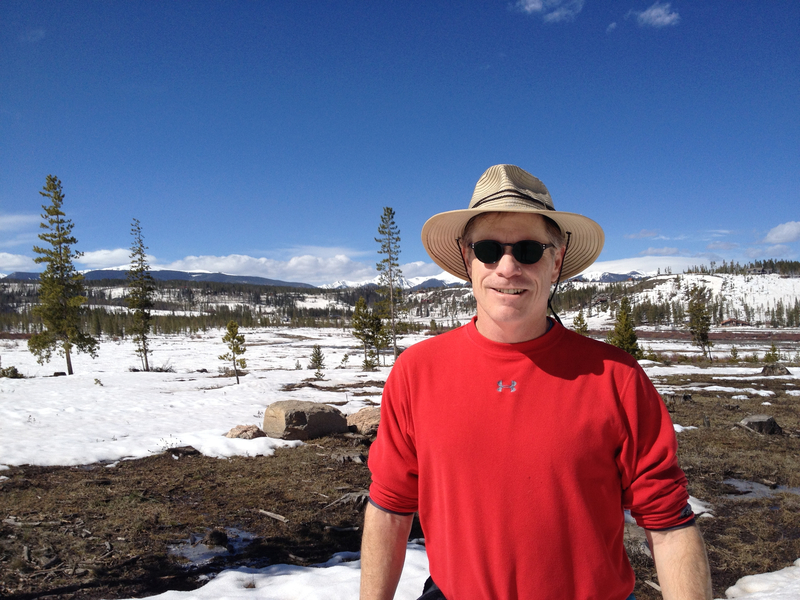 In the second photo above of the three of us, the Keystone ski slopes are to the left, behind my right shoulder. 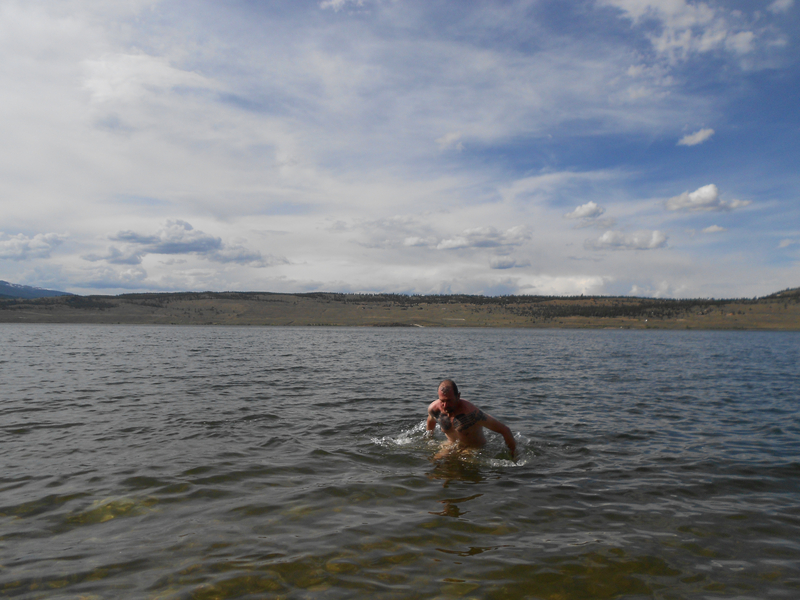 Lake Dillon and Frisco are further back. You can’t see it in this pic but we can also see the Breckenridge ski slopes back behind Keystone. Click to enlarge any of the photos. 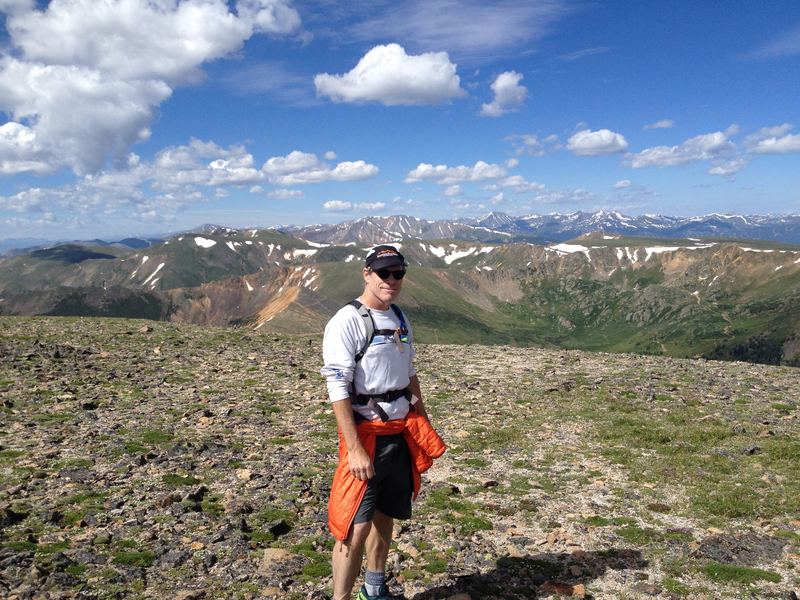 The photo here of George is on Grays Peak and looks back upon Torreys. 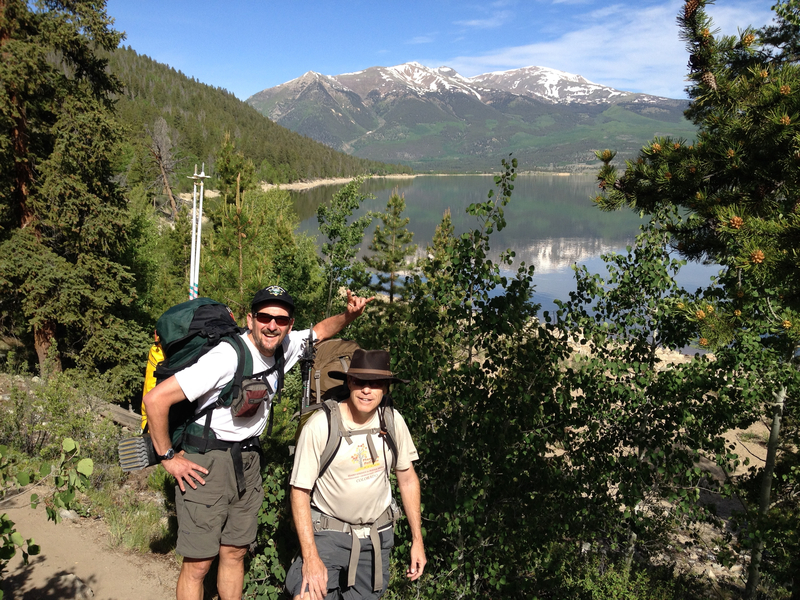 With the close proximity to Denver, there are countless other hikers. The slope spreads them out well enough so it doesn’t feel crowded, but we enjoy some lively conversation. One girl carries a Captain America shield over her backpack. 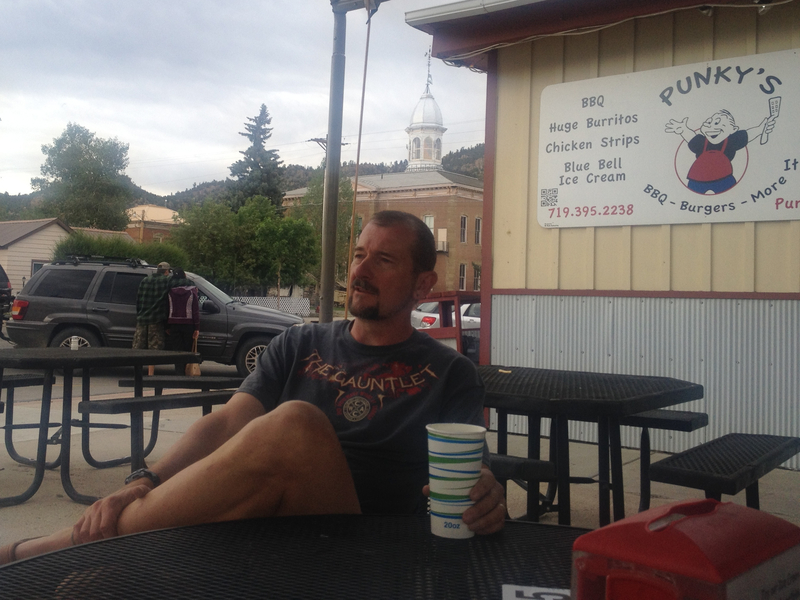 Another girl wants us to know where to meet her later for pizza and beer in Idaho Springs. She doesn’t guess from our bulging backpacks that we plan to stay out on the trail for a few days. 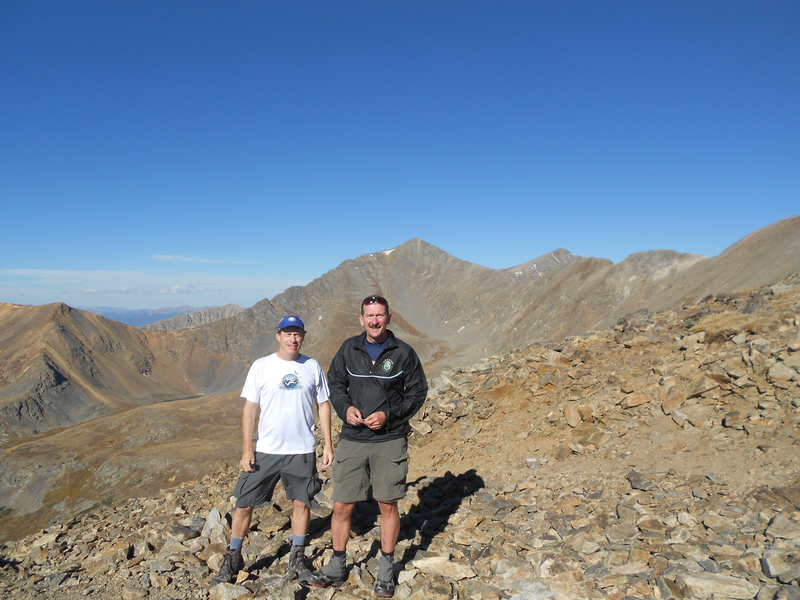 La Plata scouts our descent down the eastern slope of Grays Peak while George and I rest. There are three routes and we aren’t exactly certain because we didn’t bring a map. I do have an app of the CDT on my iPhone but it’s difficult to make sense of it without the GPS showing our location. I have it in airplane mode to conserve power. I only use it as a camera. 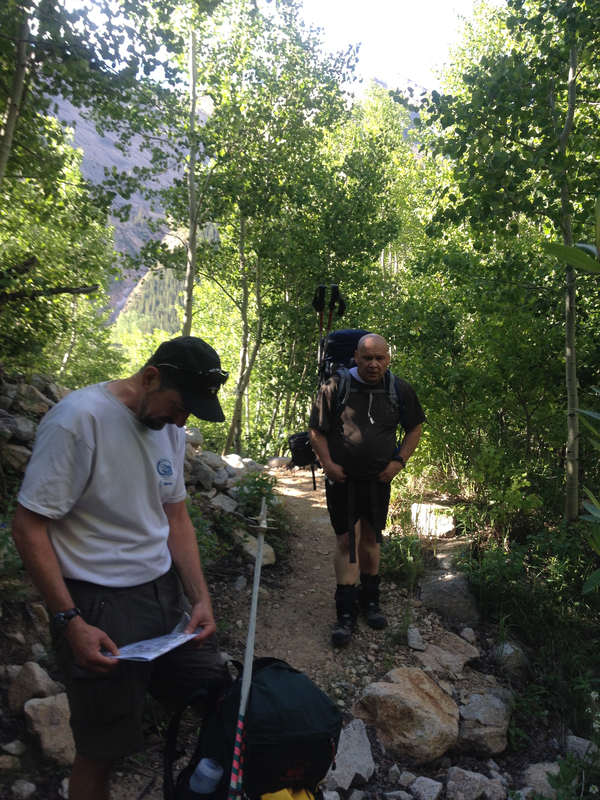 We elect to take the trail that appears to be the most direct route down to Peru Creek where we expect to camp for our first night. 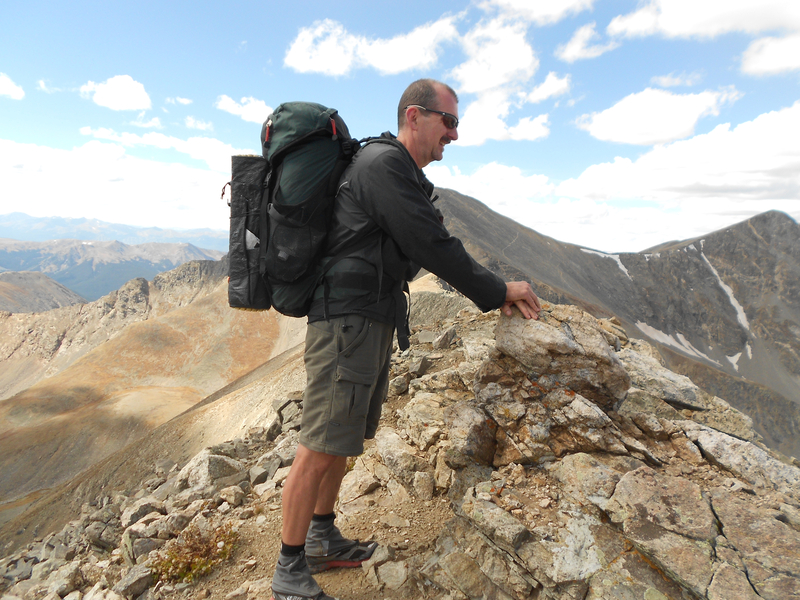 We can see the trail across Horseshoe Basin climb up to Argentine Pass, and we know that pass is on our route, so we feel confident. To call our descent steep would be an understatement. We plunge down a wicked slope of rocks and scree. 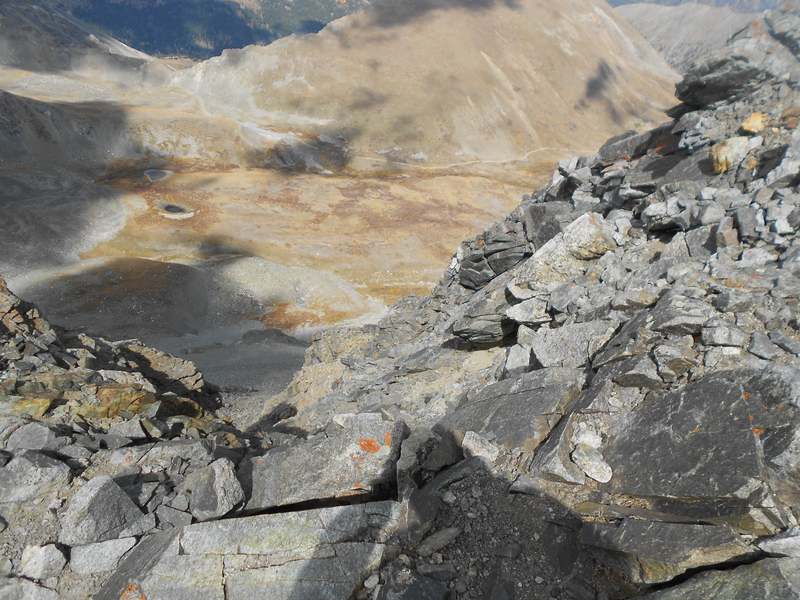 Some of the most treacherous scree I’ve ever encountered. We take care to ensure we don’t send an avalanche down on each other’s heads. And we debate the senselessness of the phrase, “head’s up”. We’re certain though we prefer this route over the trail option to the right. It would trek across some jagged crags to Ruby Mountain. That option is pictured here with the small lake at the bottom. We later meet a hiker who traversed it. He rates it a class 4 which means scrambling with your hands and massive exposure. Our route is only class 2, but as difficult as any hiking I’ve ever done. I follow Nathalie’s ski advice to George, “turn inside”. The comparison to downhill skiing is fair. We all agree we wouldn’t want to return up this trail. 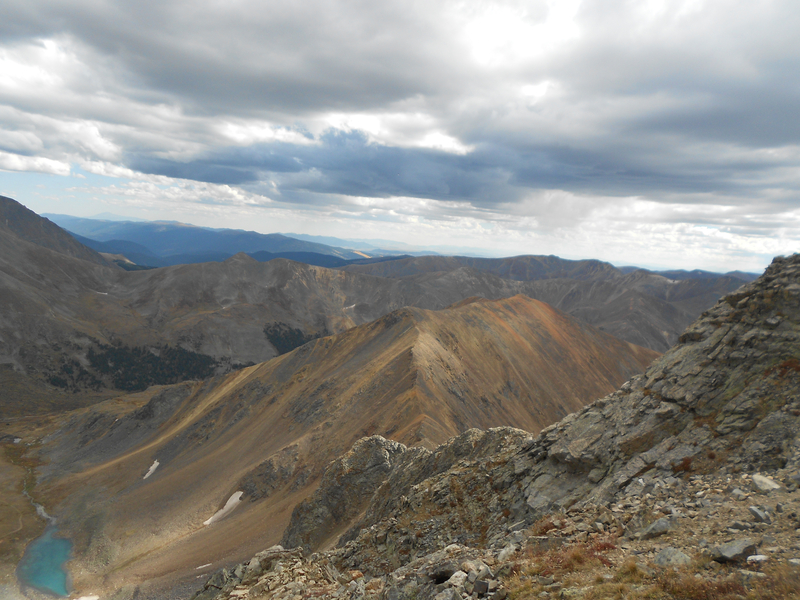 This photo depicts the trail option to the left that we could have taken from the top of Gray’s Peak. It doesn’t look easy either. And we don’t exactly see a trail on it. We find out later, this is in fact the route we should have taken. Instead, we bushwhack our way to the bottom. 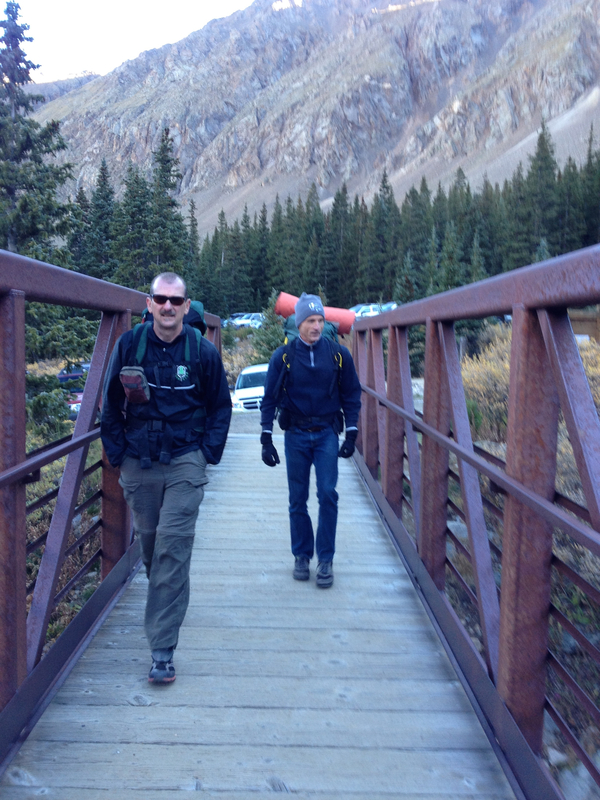 We ultimately find the trailhead for a trail to Argentine Pass. We’re fairly certain we are back on track now and begin searching for a spot to camp. There are no good flat spots but we find a site that is good enough. It’s close to a flowing creek. Having water is more critical than a flat site to sleep. We pitch our tents as the sun sets an alpenglow on the side of Mount Argentine. I scratch my forehead on a tree branch while pitching my tent. I don’t pay it much attention as I inhale my freeze-dried Mountain House dinner. La Plata sparks up an exceptional fire and we retire shortly after dark with plans to start early again tomorrow. I receive the email Friday afternoon informing me that the October 5th Boulder Marathon is cancelled. I have made such a big deal out of this race that I’m stunned. But only momentarily. 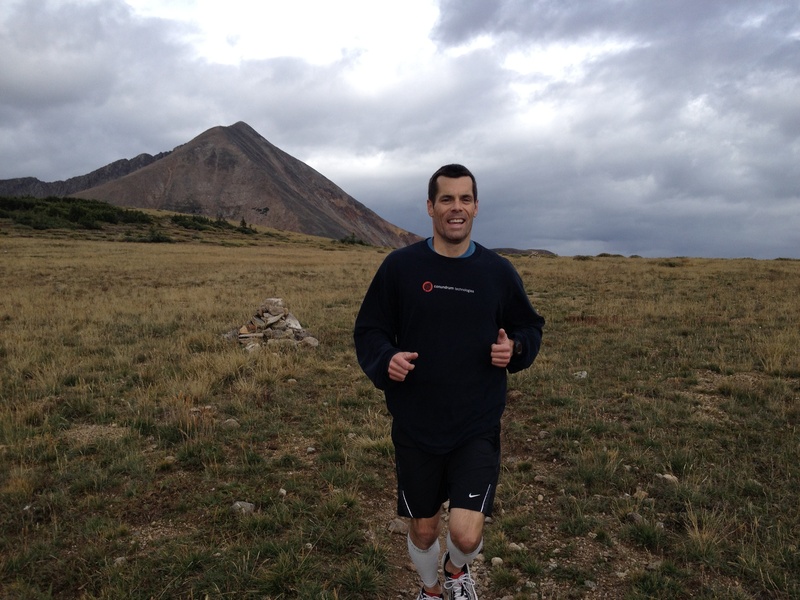 I quickly recover and register for the Denver Marathon October 19th before it’s full. I’m fast to move on. A few hours later, I drive up via I-70 to Idaho Springs. I meet La Plata at the Tommyknocker brew pub at 6:30. We break bread and share grape. More specifically, we have jalapeno poppers and mac-n-cheese with red chili. This is similar to Cincinnati chili, but with mac rather than spaghetti. Very satisfying and highly recommended. After dinner, we shuffle my van to the massive parking lot on top of Berthoud Pass and camp down at the Herman Gulch Trailhead off I-70 at exit 218. This site is less than ideal with incessant engine noise reverberating along the canyon walls throughout the night. I don’t sleep well, but at least it’s warm. We breakfast on oatmeal and trailhead coffee. At 6:30am, we hit the trail. We gain 3000 feet in elevation over the first six miles. By this time, we also shed our cold weather gear and are down to running shorts and a T. I wear my Pearl Izumi 2and1 ultra trail running shorts. The long seam brief works well to protect against chaffing. These shorts are great but could use additional pockets. I’d like to see what I call a “shark knife pocket” stitched on the brief alongside the outside thigh. It would be underneath the shorts so it would not be visible. I’m thinking of two or three times the size of the gel pockets along the back sides. Despite the steep grade, we get in a little running each mile. I can’t begin to describe how perfect this supple trail is for running. You can see it well here if you click to enlarge this photo. The ground feels raw with fresh dirt. 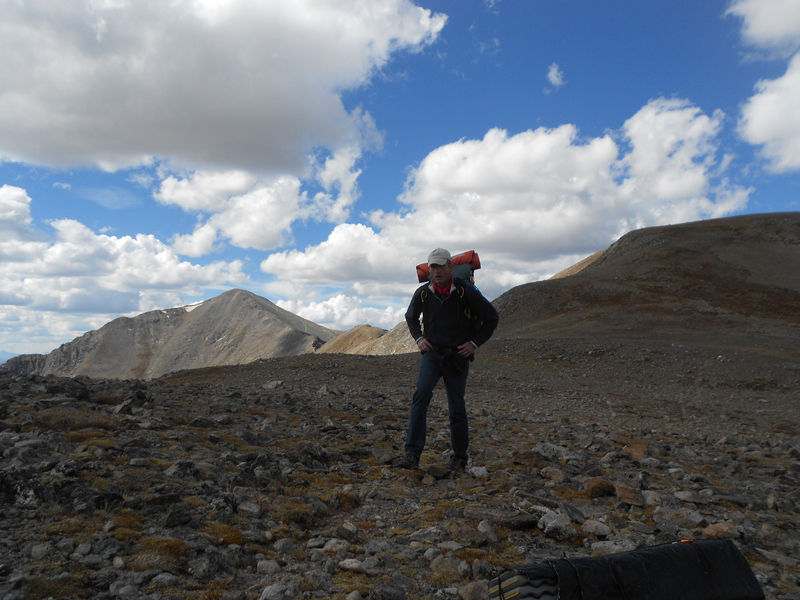 We’re quickly above treeline and mostly stay above 12,000 feet. Our highest point is 13,200. 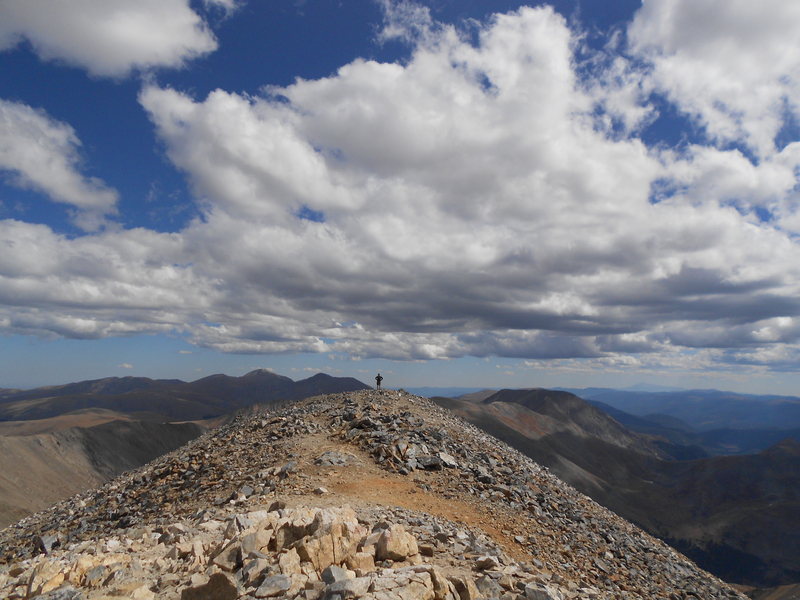 Not surprisingly for a trail following the Continental Divide, it runs mostly along the very top of the ridge with unbelievable views in every direction. 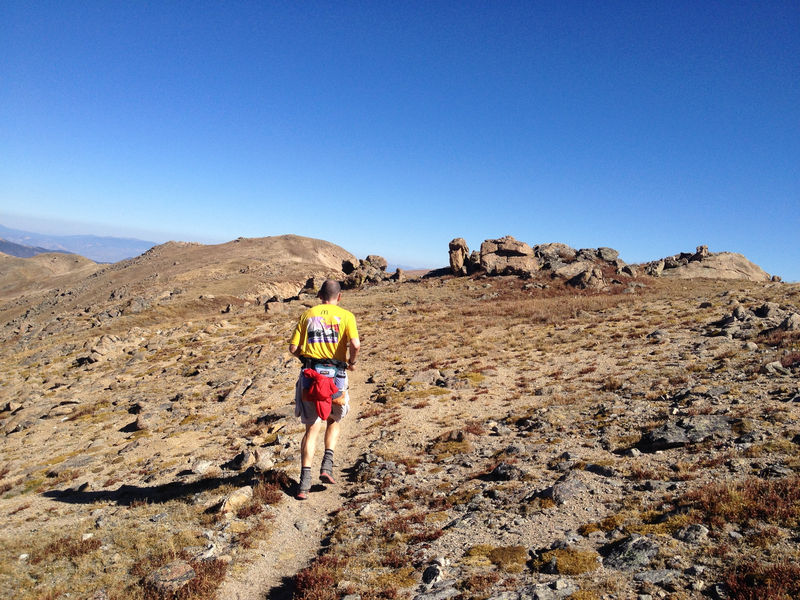 At one point, we are running a thin ridge lined with craggy rocks. I feel like I’m running across Godzilla’s spine. The sun is out strong and creates interesting light between glare and shade along the ridge. 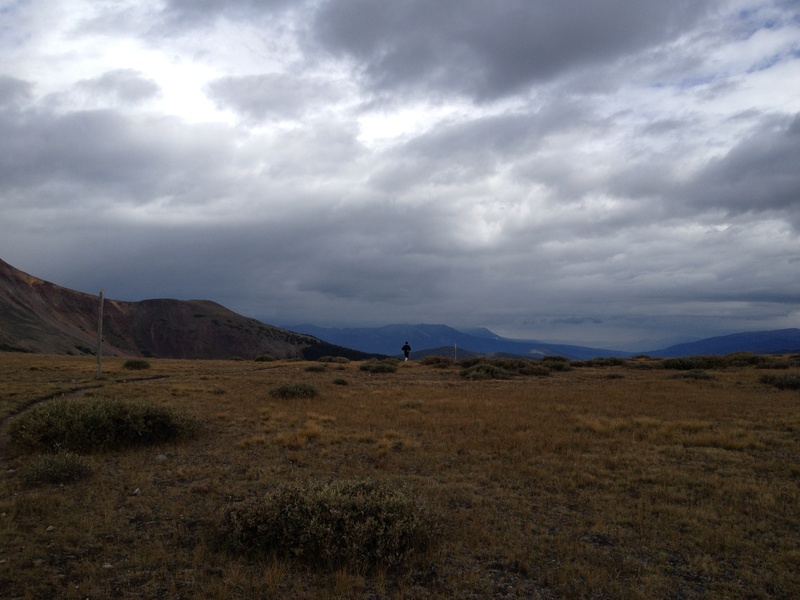 You can see how the trail undulates along the ridge in this photo with La Plata. You can even see some snow to the right. The cool air countered the full sun and kept us comfortable all day. We both forget to wear hats but apply liberal amounts of sunscreen continuously. Still, the backs of my legs are now sunburned. The muscles in the backs of my legs are hurting too. The 6000 feet of total elevation gain is a tremendous workout for my calves, hamstrings and glutes. 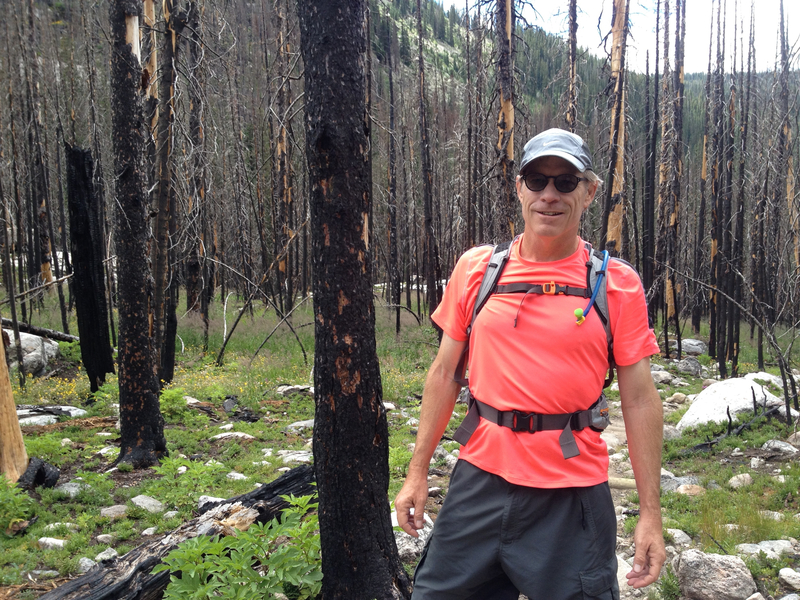 This twenty-plus mile run along the Continental Divide Trail (CDT) is perfect marathon training. Rather than the three hour, twenty mile workouts I’ve been running on the weekends, this run will take eight hours. We planned for eight and we finish with twelve minutes to spare. Clearly, it’s mostly hiking, but at an aggressive pace. 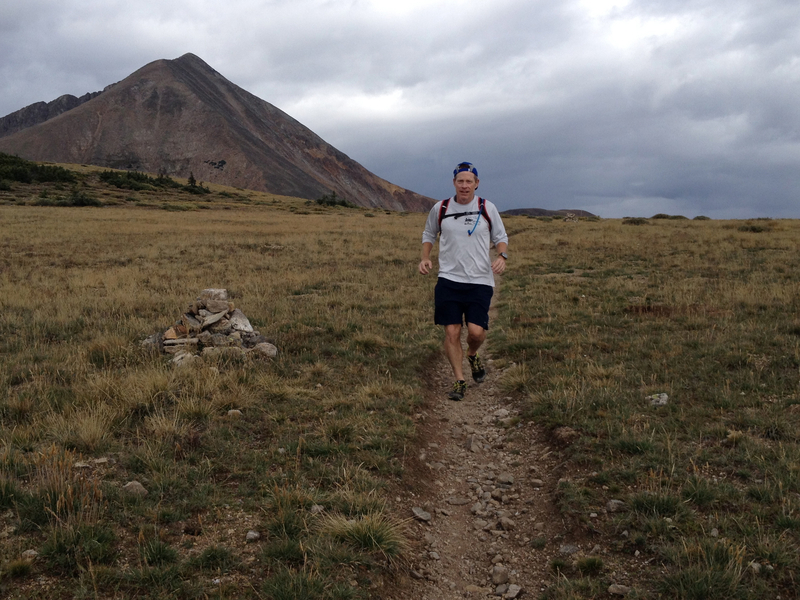 Averaging over 12,000 feet, we are often winded as if we are running. It feels great to be up here with light packs. The weight in my pack is mostly from the 70 ounces of water in my camelback reservoir. I also carry warmer gear should the weather turn bad – which it never does. For nutrition, I carry Epic Bars and Hammer Gels. I have Skratch mixed in my water. The idea is to practice consuming what I will rely upon for my marathon to ensure my stomach can handle it and that it keeps my muscles from cramping. Everything works out great. My new trails shoes also do well. These New Balance Leadville 1210s have a rock plate in the front of the sole. I don’t feel it in there, these shoes are so pliable, but I never feel any rocks either so it does the job. 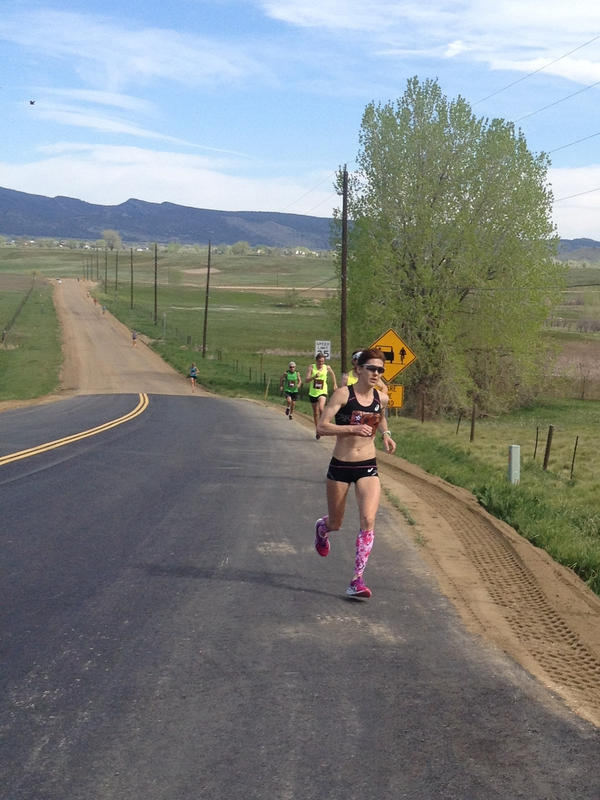 These would have been fine shoes to race the Boulder Marathon in, on that course’s dirt roads. Their tread proves capable on this extreme trail by gripping loose dirt with confidence during steep descents. My ankles are quite fatigued now, hiking boots would have provided better support. But I love being able to run a trail with light shoes and pack. I’m thinking though about buying new shoes for the Denver Marathon as that run is entirely on paved streets. I’ve been thinking about buying a pair of Hokas. I know they are a bit gimmicky, but everyone I’ve talked to, like Gadget Girl, absolutely loves them. I would need to train in them of course first, but I have time for that. Another new item I intend to pick up for the Denver Marathon is a gel-like snack La Plata gave me – GoGo Squeez. It’s 30 calories less than my 90 calorie Hammer Gel, although 3 times the volume at 3.2 ounces. Still, the real fruit content is yummy. Not often you can say that about these sports foods. Plus the twist cap is convenient and overall the pack is less sticky than gels. There is nothing better than real food. Fruit performs well in terms of supplying quick energy. All these products do well on my stomach while running. And fortunately, I didn’t have issues with the poppers from the night before. I expect to see more people out on this trail, being so close to Denver. I can’t imagine a better day to be out here. We do see a couple wearing Beaver Creek caps. Several other hikers and one trail runner. And a few bikers. They really impress me with the technical nature of this trail. Good for them though, riding on top of the world. 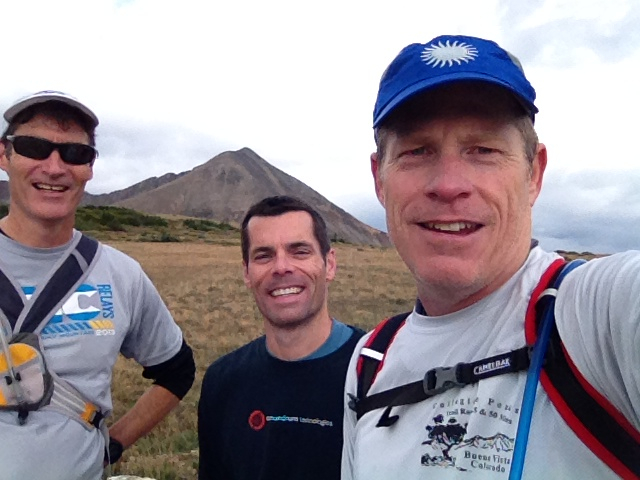 Saturday’s 20.6 mile trail run was so much better than I could have imagined. Perfect in every way. From the weather, to our pace, to my conditioning that made itself evident. Despite the altitude, my breathing felt strong. And the workout my legs received will help me in the Denver Marathon. We lunch at Jenny’s, a small cafe in Empire. We both eat the half pound buffalo burger. Very tasty. 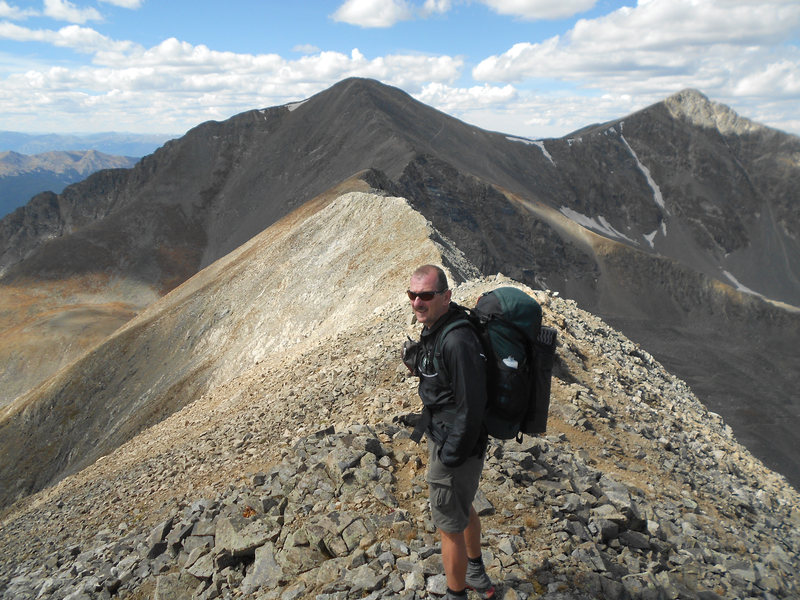 We will meet up again next weekend for a forty mile backpacking hike along the CDT that extends from near Breckenridge to the Grays and Torreys Peaks. We’ll be joined on this outing by La Plata’s college buddy, George Schools. George is an extremely fit athlete from Austin. This could turn out to be a three-day race under the load of 35 pound backpacks. Can’t wait. 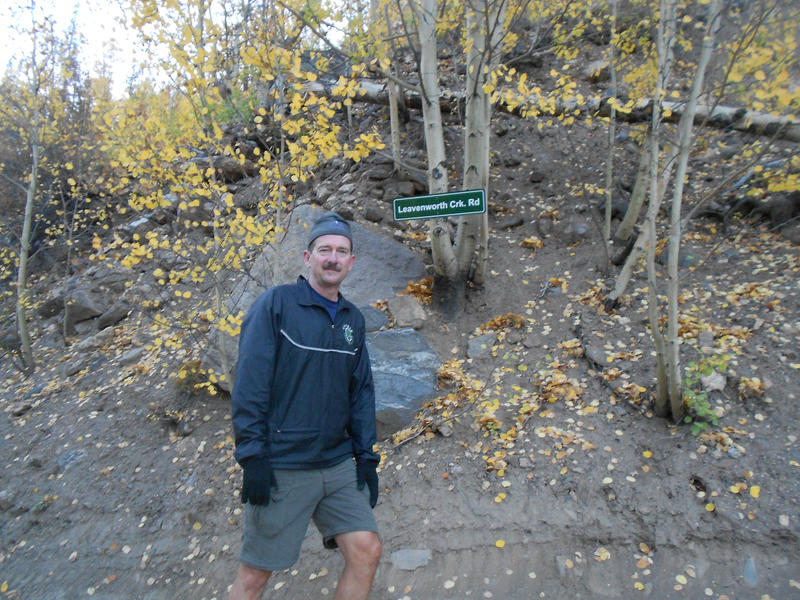 Our final morning begins with a short hike, couple of miles maybe, back to the trailhead and La Plata’s truck. 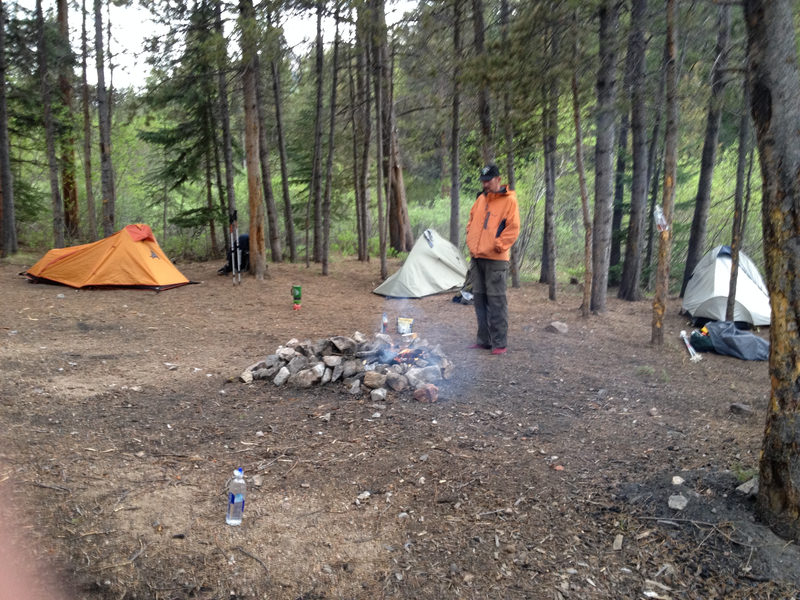 We lighten up our packs since we won’t need tents or sleeping bags for today’s hike. We then set out on our first northbound direction toward the Alpine Tunnel. This is what remains of an old rail line that supplied miners back in the day. The trail itself actually follows the old tracks, although only a few timbers remain. There is a surprising amount of snow on the trail. Probably because the trail appears to be on the east side of a hill. And we are just under treeline as you can see in this photo. Each of us brought along our trekking poles in case we need them, which we do later. Initially though this trail, following an old railroad grade, is fairly pedestrian. 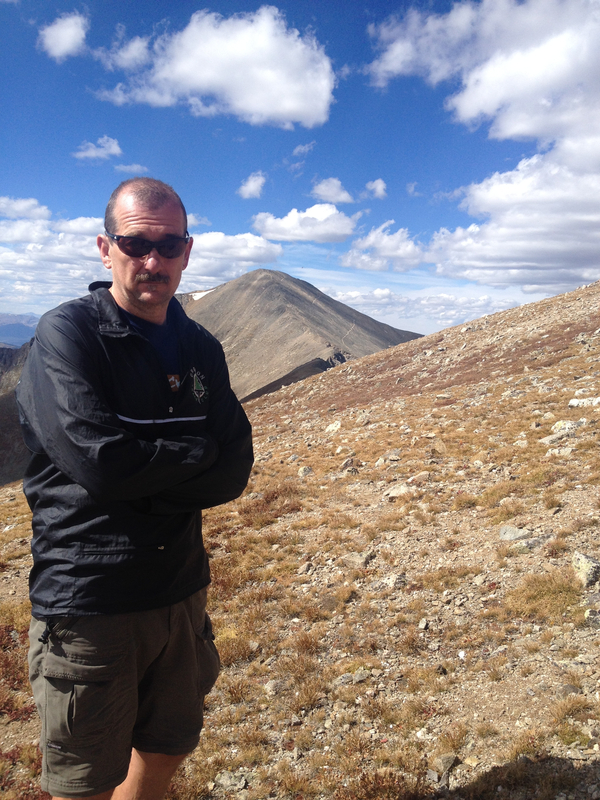 Discounting the extreme altitude. We also brought along head lamps thinking we would need them to walk through the tunnel. We were wrong. That’s the east portal of the tunnel behind us. Nowhere are there any signs or clues that the tunnel has been caved in for years. Maybe the west side is open but we don’t go there. Instead we hike up over the ridge to Tunnel Lake. This is where the trail becomes challenging. Snowfields are quite large. 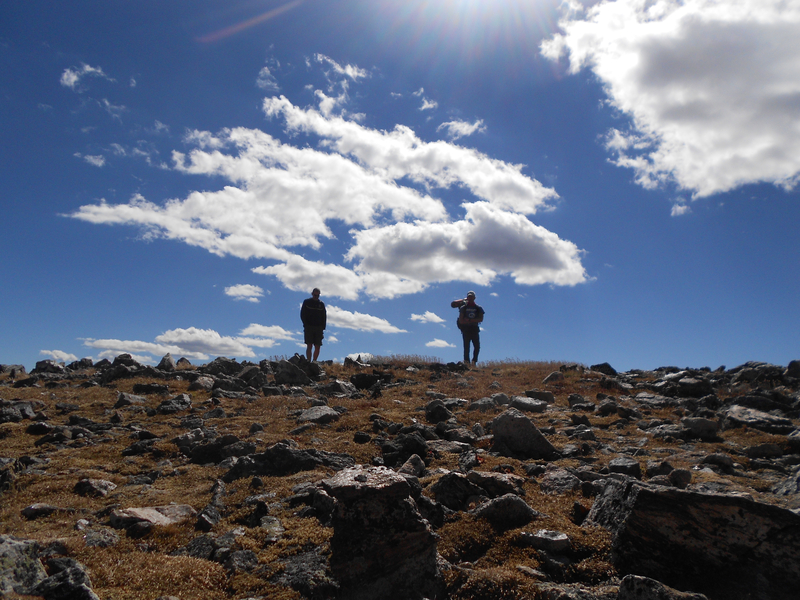 One forces us to bushwhack across a boulder field which is arguably more dangerous, albeit quicker to navigate. Mike and I turn around at this lake while La Plata sprints a few minutes further to capture the pass as part of his CDT quest. Maybe Mike is trying to get to DIA early for his flight but he leads the return at such a torrid pace I am unable to keep up. He must have gotten in shape on this trip. And seriously, what a week. Every day was simply amazing but at the same time, the week was totally exhausting. We are all ready to return home to our families, while talking about our next hike. La Plata wants to train us with some snow and ice skills. Mike wants to get his three boys up here. I want a shower. We clean up again at the Mount Princeton Hot Springs which is located on the drive off this mountain. Three hours later I drop off Mike at DIA. There most definitely will be a next time. We sleep hard and wake up refreshed around 5:30am. You would expect we slept well given our previous day’s activites, but I found it surprising. 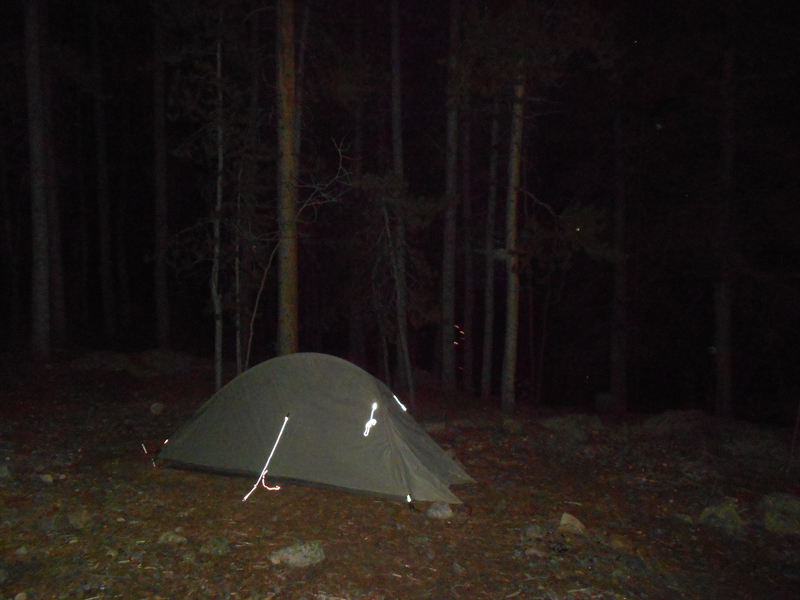 My experience camping on the cold, hard ground is that I’m typically up every hour peeing in the woods. Mike and I both credit our incredibly comfy REI sleeping pads. Mine is the REI insulated air Stratus model. It weighs less than 1.5 pounds and compresses to almost nothing inside my pack. It’s just wrong that most pads are larger and heavier than sleeping bags. I highly recommend this blow-up air pad. Sipping our camp coffee, we recount our previous day’s activities and assess the corporeal damage. Our encounter near Twin Lakes yesterday with a young girl running harnessed to a pony has by now taken on mythological proportions in our memories. She looked 16 but might have been a 20-something elite runner. She was physically bound in leather straps to a pony and running behind it similar to the sport of skijoring. This morning she is a nymph traveling by unicorn. 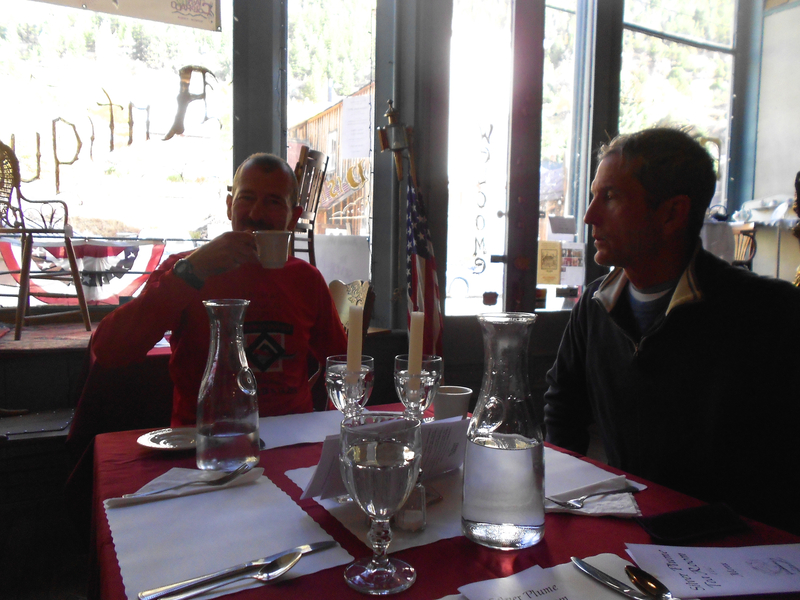 The affects of fatigue and coffee at altitude. My legs feel totally refreshed today but my shoulders are bruised from the weight of the pack. My right shoulder has a burn from sliding off and on the shoulder strap. 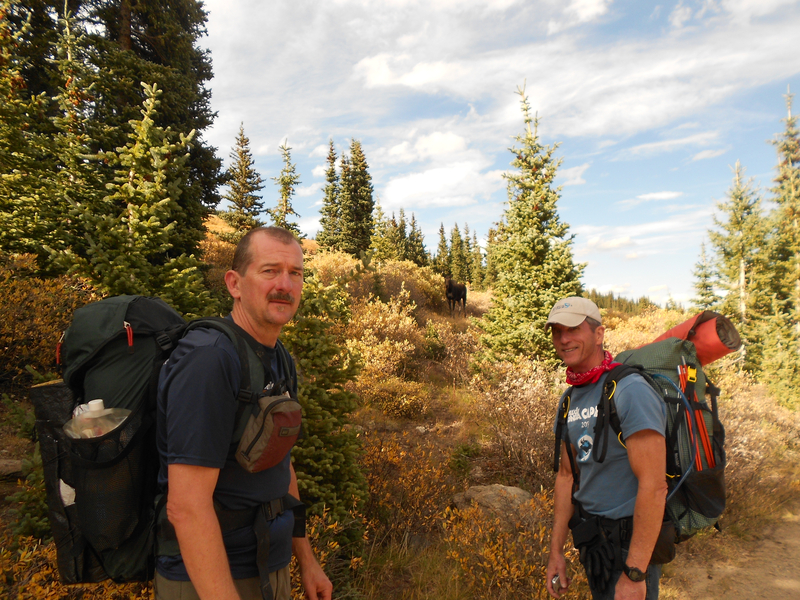 Mike and I are both ready to join Rob though on yet another massive hike up yet another mountain pass. We set out again following La Plata along a comparatively flatter trail that traces the contours of the south fork of Clear Creek as it rises towards its headwaters in Lake Ann. We have our trail legs under us today and our pace begins strong. I made adjustments to my backpack during the first hour of yesterday’s hike and the better fit mitigates that weighty beast of burden. 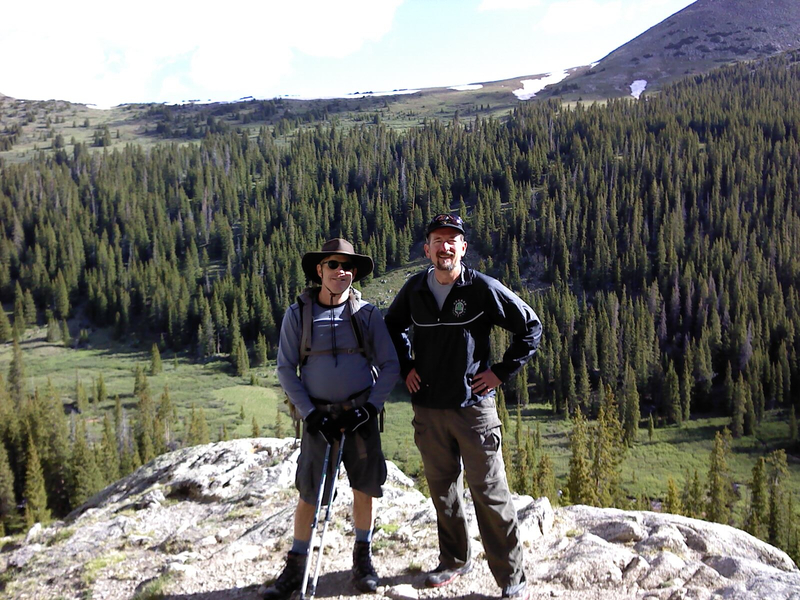 The weather is ideal for hiking and even our southern compadre wears shorts today, and in fact every day. We meet several other hikers today, including northbound thru-hikers. 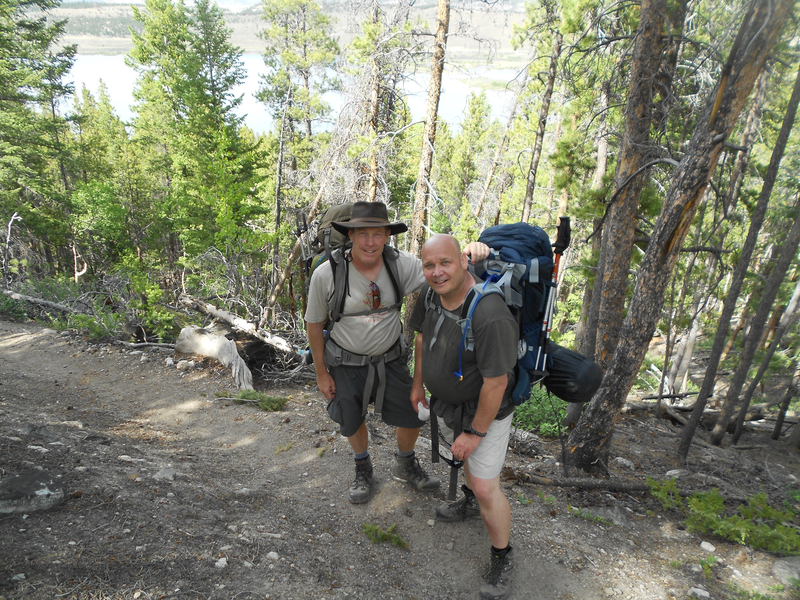 These are hikers who begin the CDT at the Mexico border and continue onward to Canada. We are considered section hikers ourselves. One such group of NoBo thru-hikers is a family of two athletic parents and a young girl no more than 12 years old. 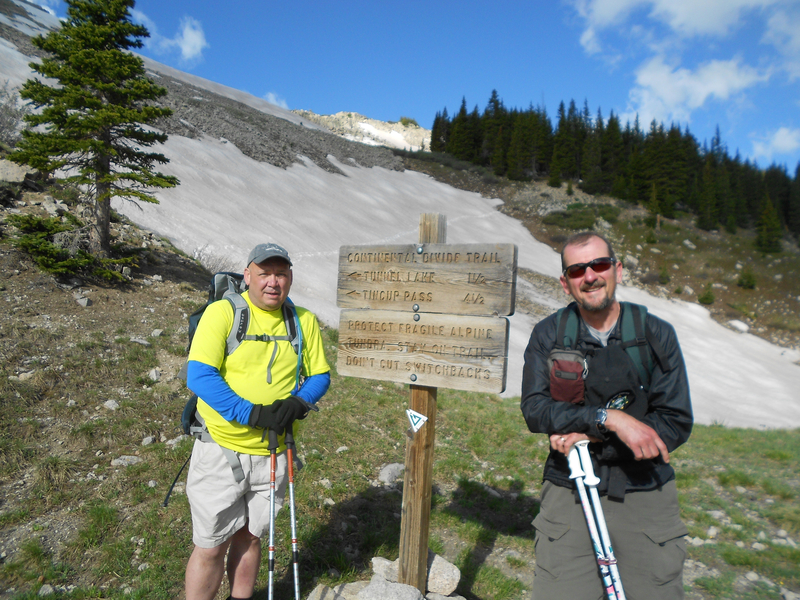 They relate their experience traversing Lake Ann Pass. A large snow field sits on the north side of the pass and they were required to glacade down – sliding on their bottoms using an ice ax like a rudder for control. A twelve year old did this! Amazing! We consider the possibility that we might not be able to cross Lake Ann Pass. Final determination requires closer inspection so we continue our trek onward. 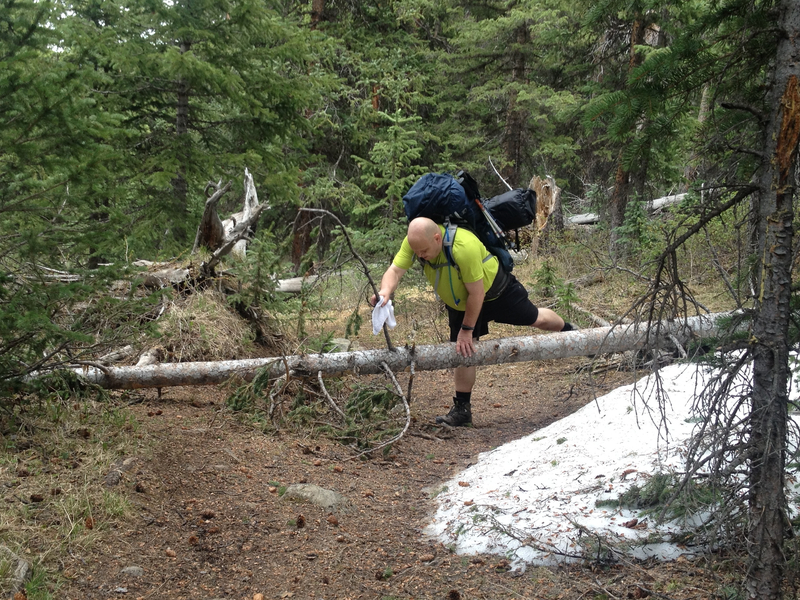 We face a number of challenges on our way up to Lake Ann. 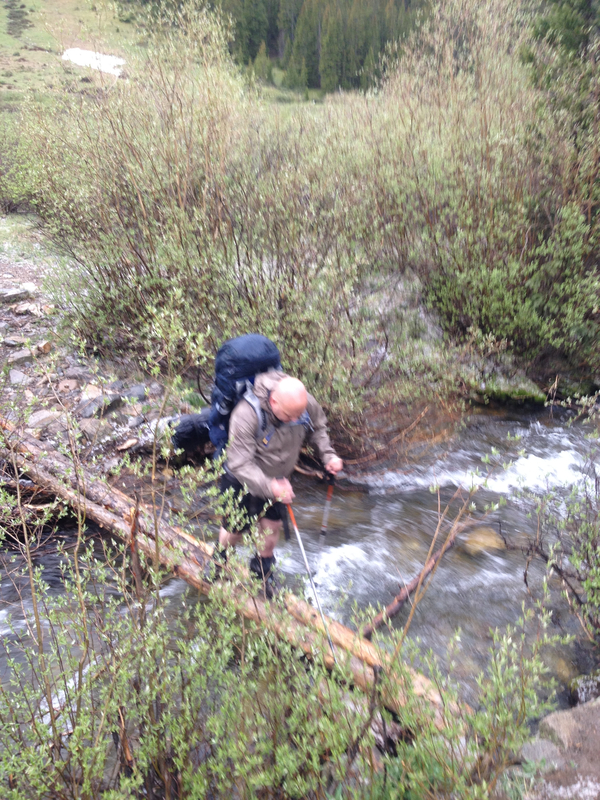 Creek crossings are savagely perilous. I’m thankful for my waterproof boots. 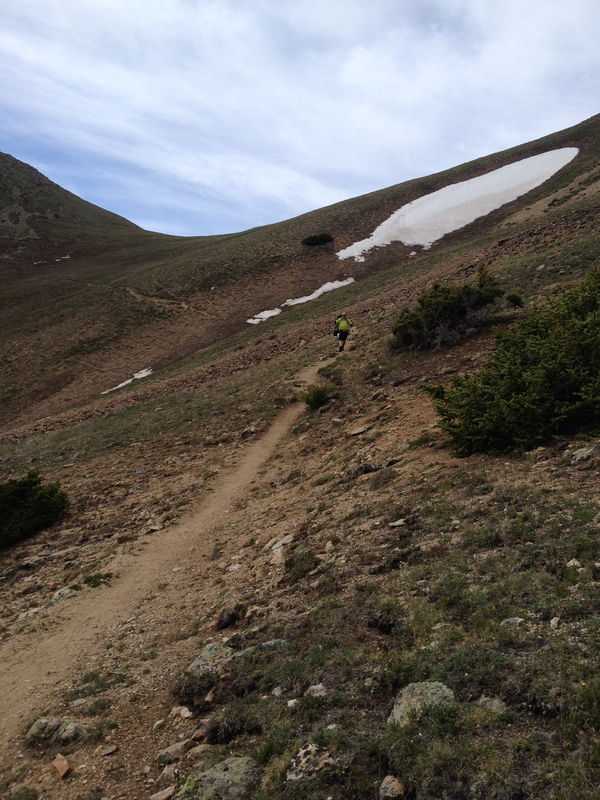 Snow pack across the trail increases as we approach Lake Ann above 11,000 feet. This reduces our pace to well under one mile per hour. Mike learns what a momentum killer it is to post-hole up to his crotch in freezing snow. Two days earlier he was basting in the 90° heat of Austin, Texas. As we near Lake Ann, our progress slows to a crawl. 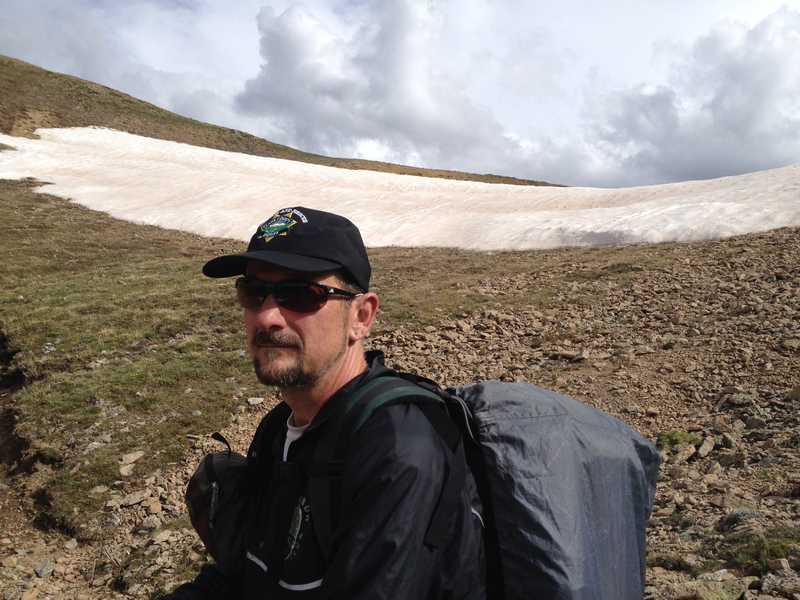 We vote for La Plata to drop his pack and sprint up the rest of the way to scope out the possibility of us navigating the snow field atop the pass. Mike and I sit down to rest. La Plata returns 15 minutes later to report that we don’t stand a chance of crossing the pass. We don’t have the gear or quite frankly the skills and any attempt would be reckless. Way too early in this epic hike to kill ourselves on day two. 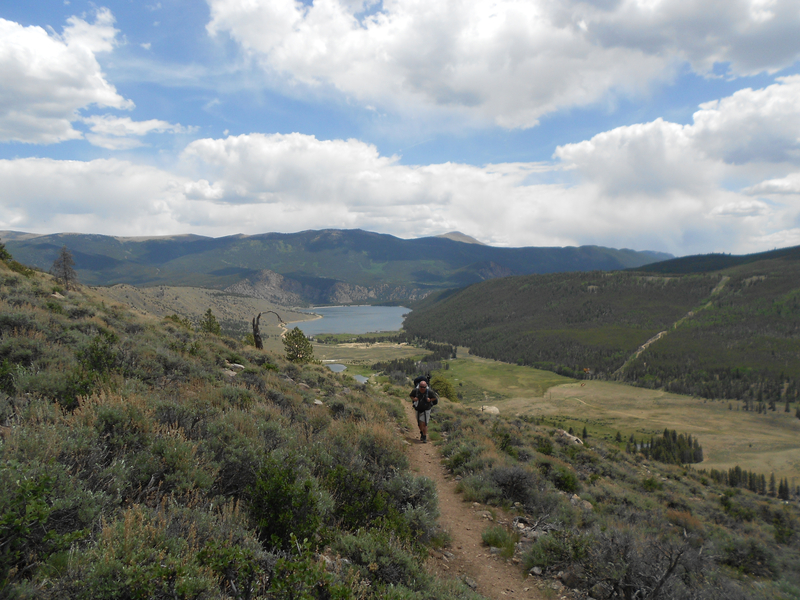 Instead we map out plan B, deciding to make a loop out of returning to our car at Twin Lakes via the eastern loop of the Colorado Trail. We can’t reach that tonight but will hike a jeep road in the morning across the valley. It will be long at 16 miles but also below treeline, compensating the effort. La Plata and I are evasive in our responses to Mike when he queries us on the distance. Today’s hike isn’t finished yet as we have several miles to backtrack and then hike up the trail that would lead to Mt. Huron. We have incredible views of the three Apostles all day, which are in the background of the fourth photo in this blog post. The temperature drops and it rains on our descent. This evolves into rather heavy snow, more than yesterday. Not so much as to obscure the trail but we found ourselves gearing up with rain protection on our return. Once we reach a 4WD jeep road, we begin to discover choice camp sites. We desire one with ready access to water and stop once we find that. Mike retires to his tent without dinner. He may have experienced some altitude sickness today which makes it difficult to eat or drink. He misses out on our first campfire. We figure he’ll feel better once he stops hurting. We’ll check on him if he wakes up in the morning. Ran for the second day in a row. I dressed in tights and a light jacket to withstand the blowing snow and 38°, but man it felt so good. I can feel that I’ve lost my strength. My speed is back at zero. But I also can sense that I could regain my fitness fairly quickly with enough discipline. Thirty days will not create too large of a gap to overcome before my next big event. 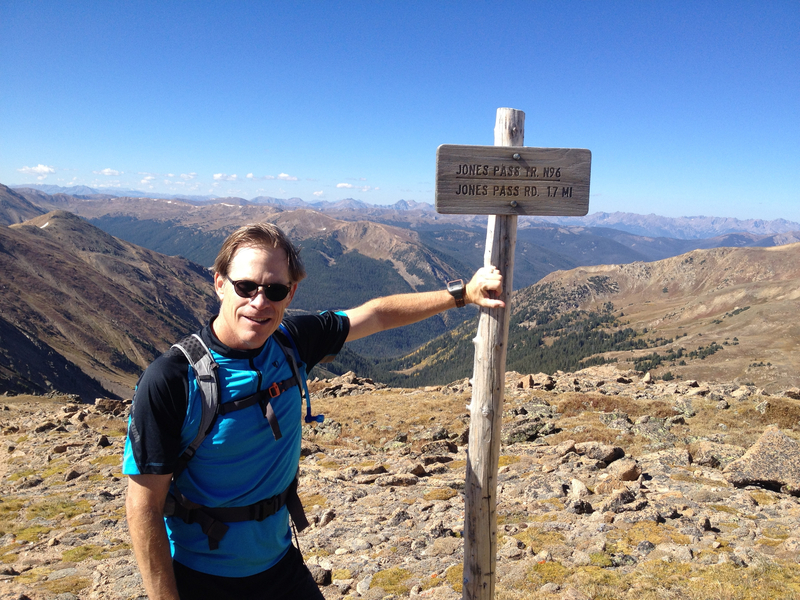 Of course, my next big event is no longer the Bolder Boulder on Memorial Day – I’ll be walking that with Ellie. 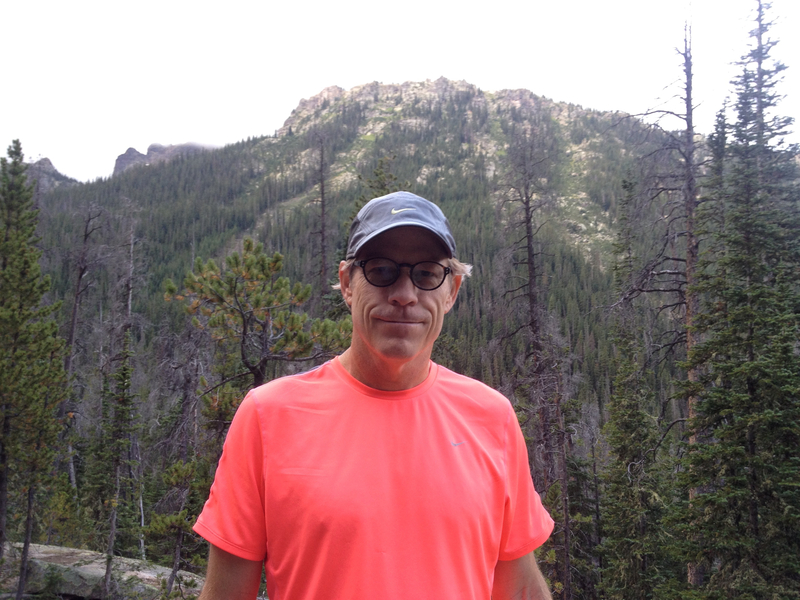 My next race is now set for the fall – the Boulder Marathon. I took second in my age division last time around. 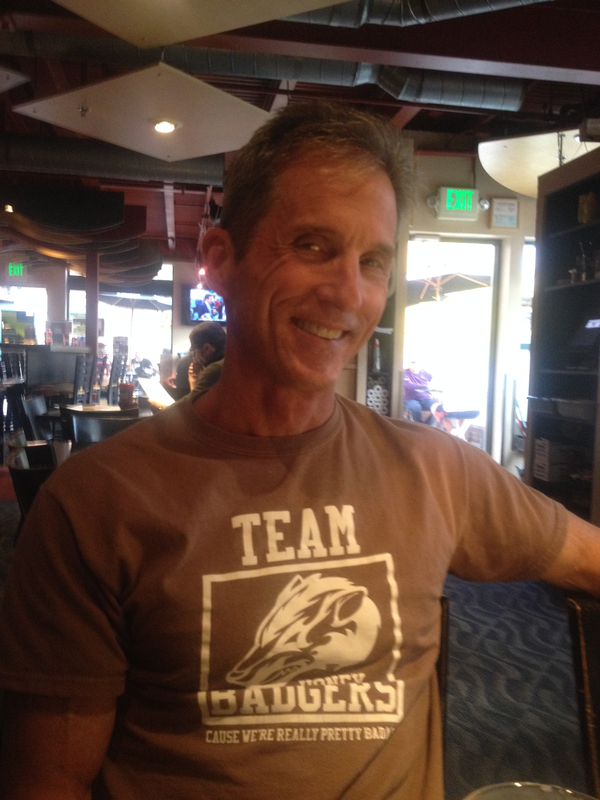 The goal this year is to maintain pace with my buddy Chris Price and try to win my age group. 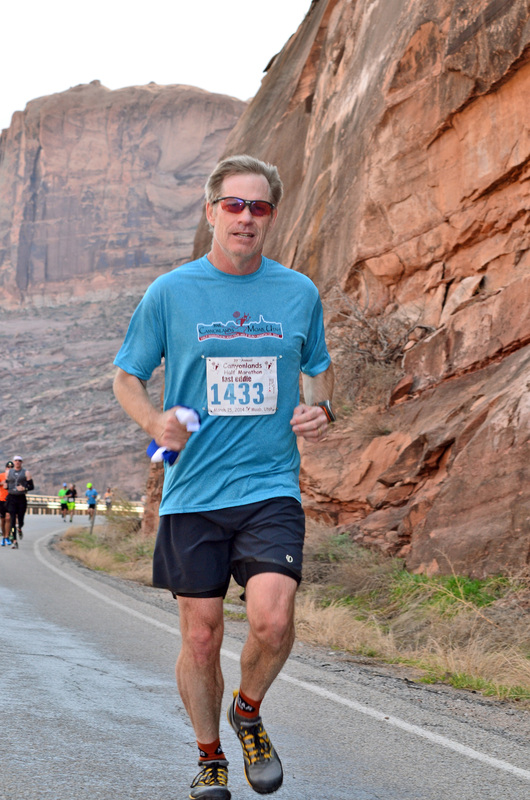 This photo is of my last event two weeks before surgery – the Moab Half Marathon. 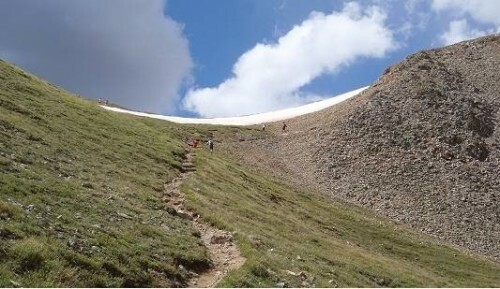 If I broaden my scope beyond simply running, my next big event is really an 80 mile hike along the Continental Divide on the Collegiates West Loop of the Colorado Trail. I’ll pick up Mike at DIA, Saturday morning June 21. He’ll fly out from his home in Atlanta. We’ll drive three hours directly to Buena Vista to hook up with Rob. 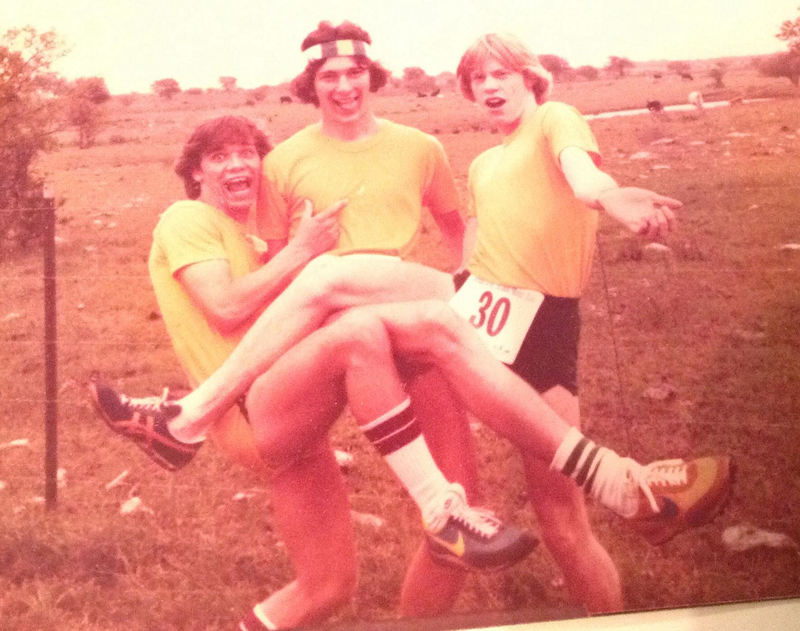 This photo captures the three of us preparing for a 10K road race 35 years ago in high school. I know what you’re thinking. I haven’t aged much. 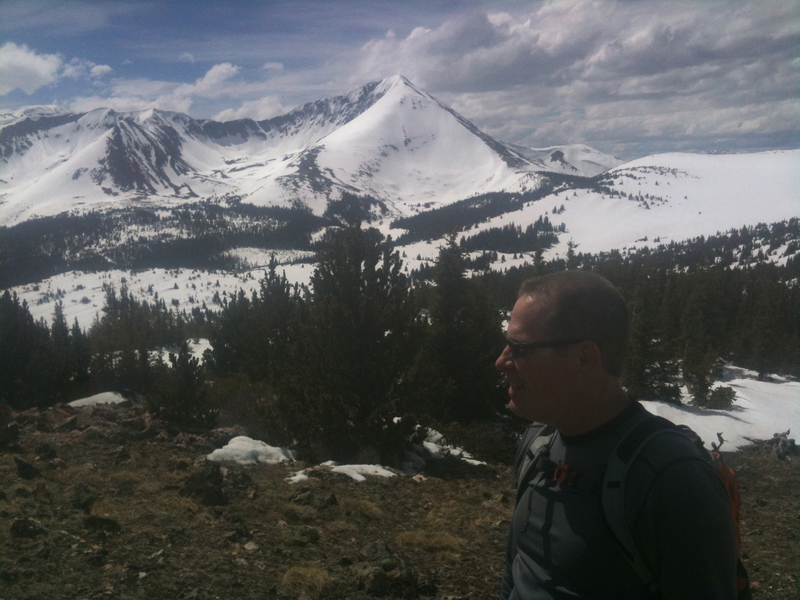 We plan to start from Twin Lakes and hike south toward Monarch Pass. This is where Mike and I gain our trail legs. 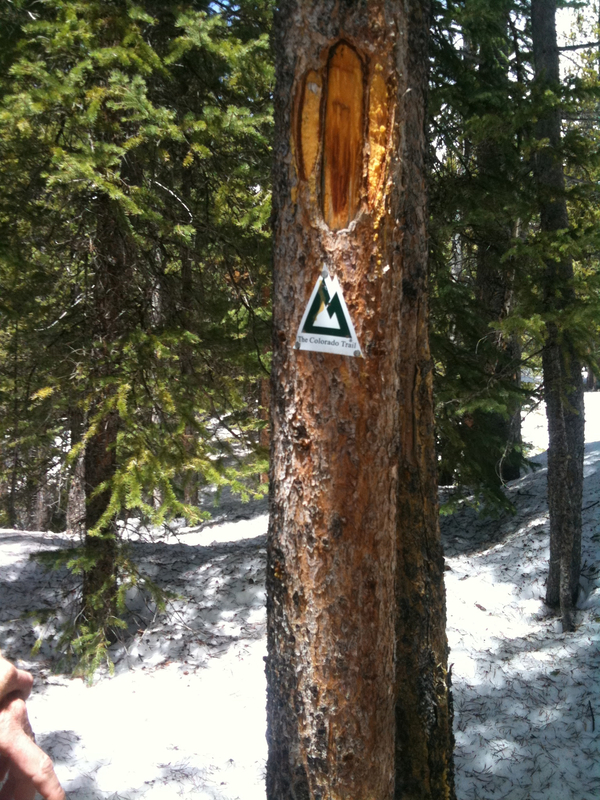 The Twin Lakes Trailhead sits at 9200 feet off Hwy 24 and 82. 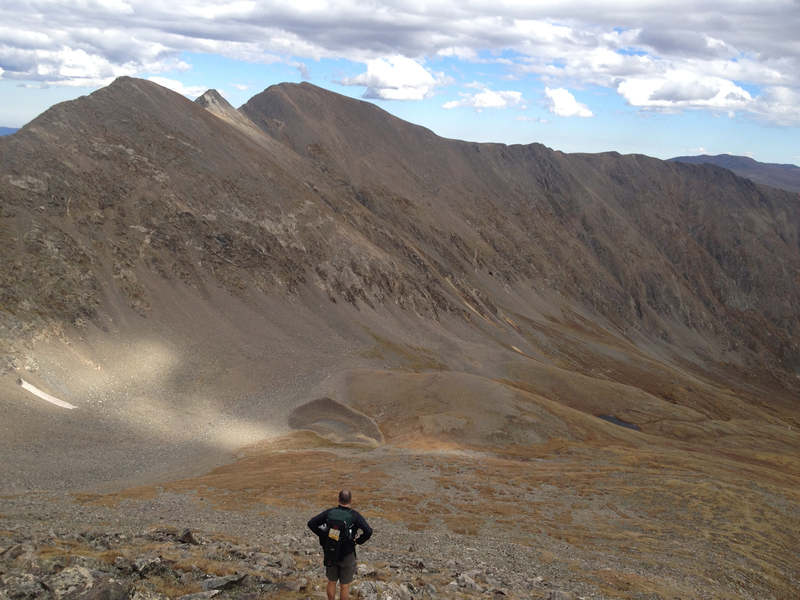 The trail leads south/southwest and rises through Little Willis Gulch over the next six miles to 12,500 feet, peaking at Hope Pass (pictured here) – which is the highest point of the Leadville 100 trail run. This is an average 10% rise, which at altitude will have Mike and me breathing as hard as if we were running. I only mention me and Mike because Rob is a mountain goat. 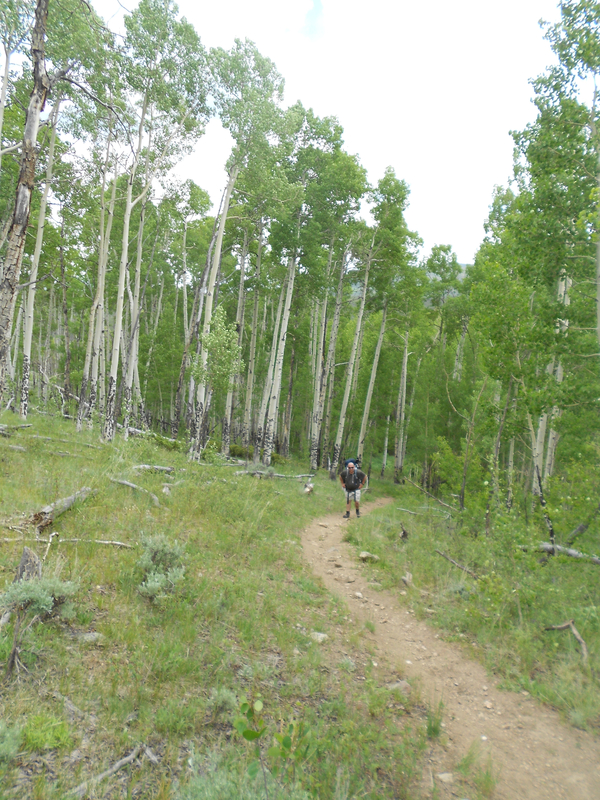 The trail then drops steeply, three miles through some switchbacks along Sheep Gulch down into Clear Creek which lays between 9800 and 10,000 feet. This 16% down slope should sufficiently shred all our knees. We’ll end our first day either here in Sheep Gulch or a few miles down along Clear Creek and set up camp. We follow Clear Creek west along the Pack Trail for three miles and veer left (south) at the South Fork. We follow this course and reach Lake Ann after six additional miles. Assuming this is day two, we might rest here at 11,800 feet for lunch. 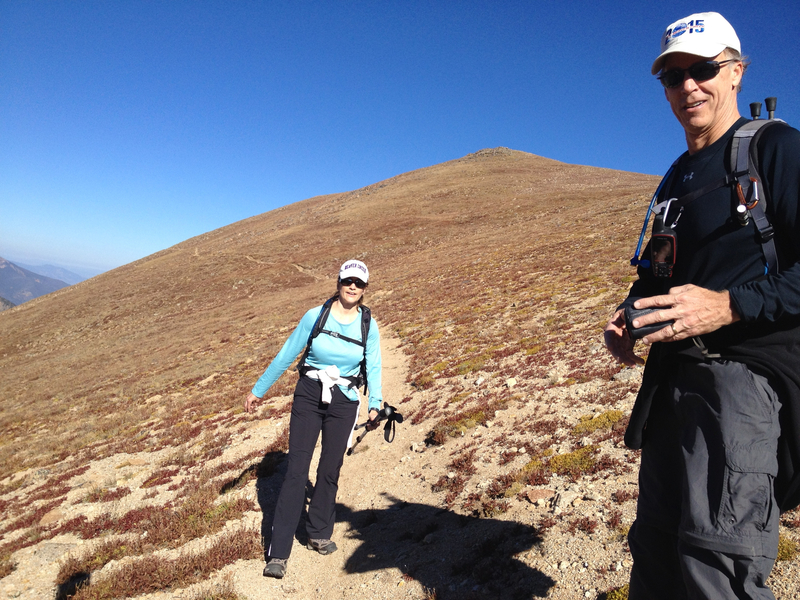 We start up again heading south and rise up to a saddle at 12,600 feet after another mile. 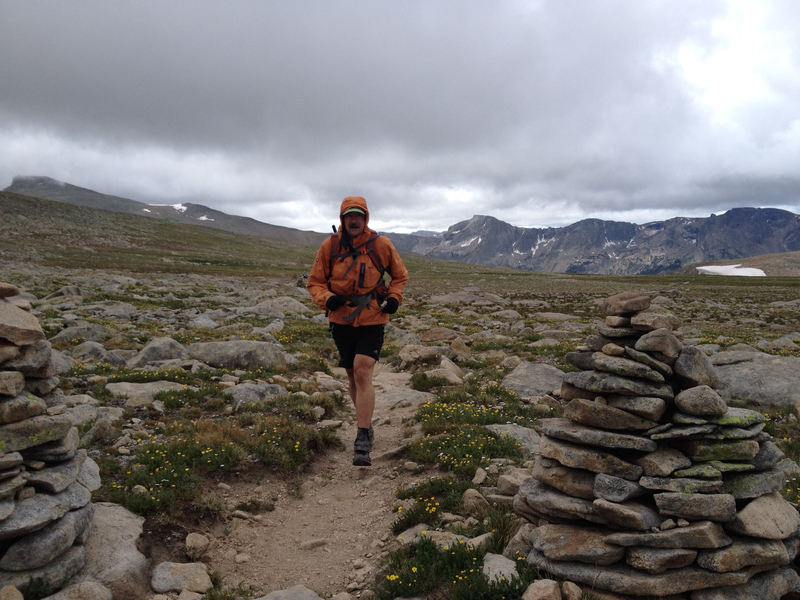 We quickly drop back down to 11,000 and bounce along a series of undulations between 11K and 11,200 feet before settling around 11,400 feet along the Timberline Trail. After eight and a half miles, we drop through Prospector Gulch to Texas Creek. This puts us back onto Pack Trail and we follow the creek for another four miles before crossing it. We could camp out somewhere within those four miles. 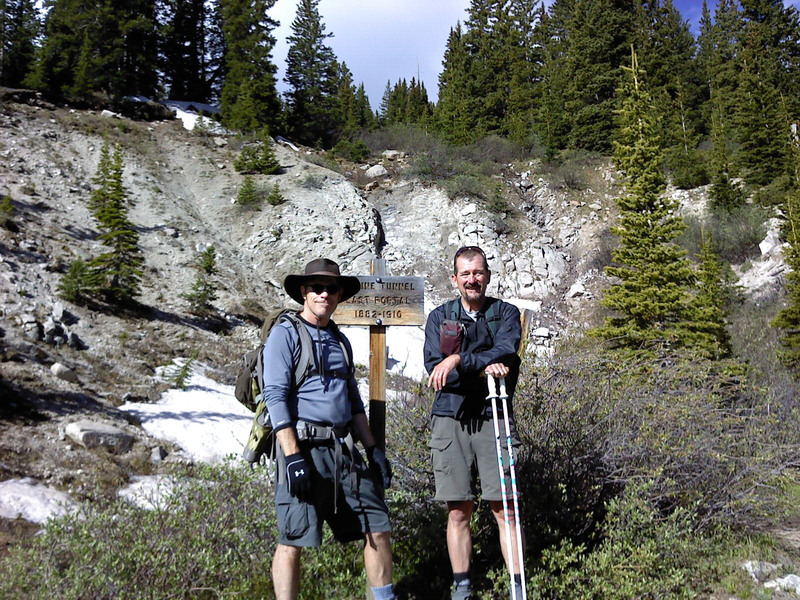 After crossing Texas Creek, we rise up above treeline and continue for yet another four miles, veering onto the South Fork of Texas Creek until we reach Cottonwood Pass which sits at 12,200 feet. One of our cars will be parked here with a cooler of libations. We’ll shuffle a car down to Monarch Pass, likely adjust our gear, and then eat a real dinner in BV. If we have time, we’ll also squeeze in a bath at the Mt. Princeton Hot Springs. 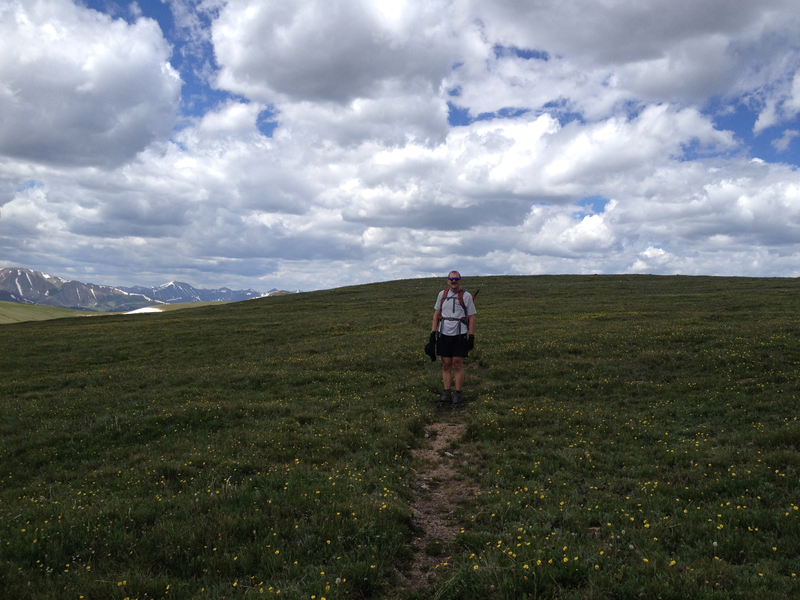 The second forty miles of our backpacking trip will continue from Cottonwood Pass and end at Monarch Pass. 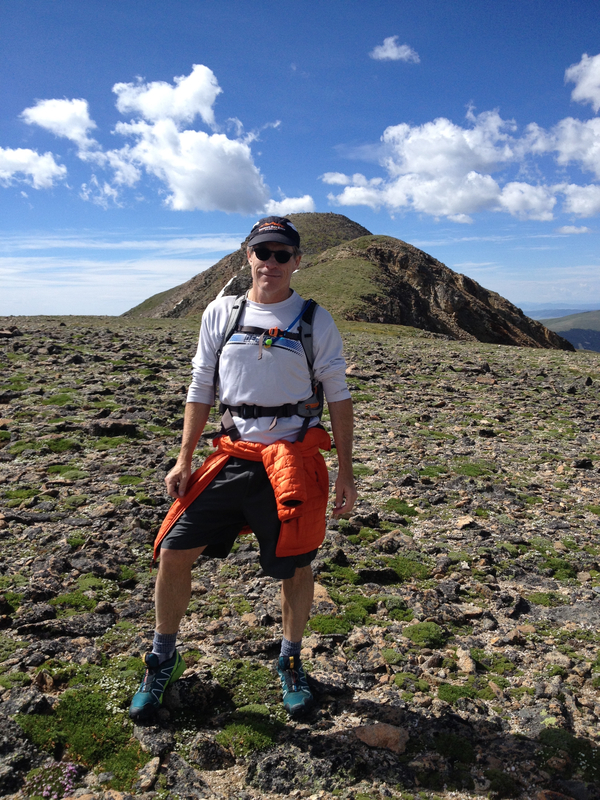 The average elevation will hover at 12,000 feet. Despite it being the end of June, at this altitude there will be snow. 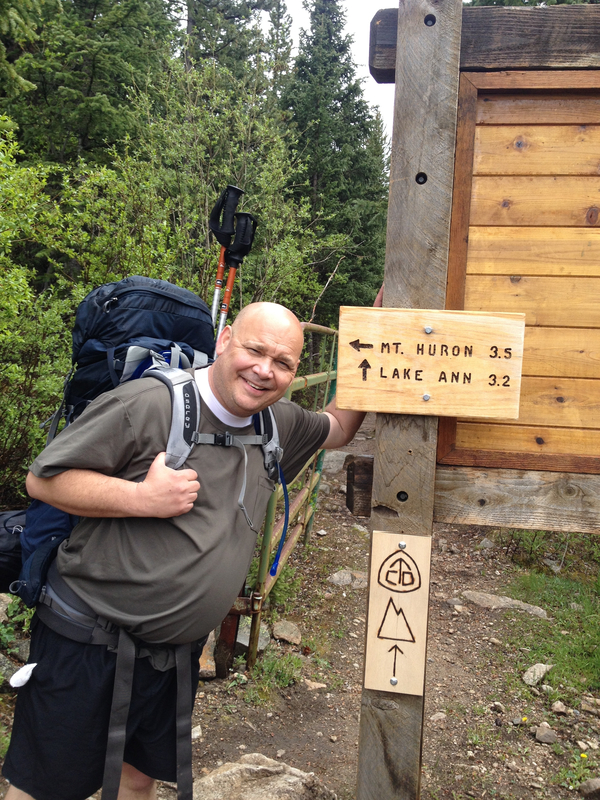 The entire 80 mile hike will take either five or six days. We have enough time in our plan for contingencies. I agreed to this get together just after my surgery while still sporting a catheter tethered to my bladder. A boy needs goals. I had no ideal then if I’d be prepared but now that I’m running again I feel fully confident I can hang with these guys. Time to close the gap. The email came in at 11:16 Friday night, just as I was going to bed, officially notifying me that the Boulder Marathon is cancelled until 2014. Disappointing of course but not surprising. This flood is a disaster. But you know what? Anyone can run a marathon. 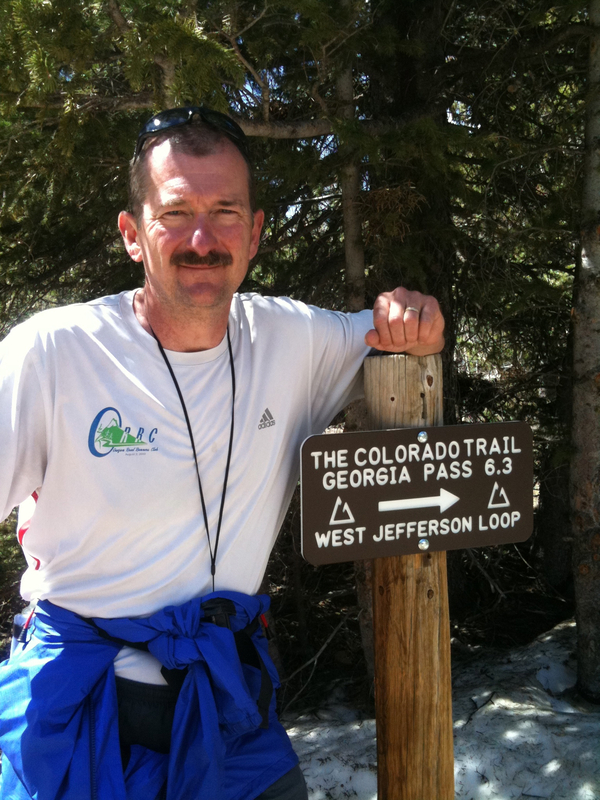 Try running 16 miles over Georgia Pass. I got in a 7 mile run Saturday with Steve and went out this morning at 5:30am, but not to run my planned marathon. 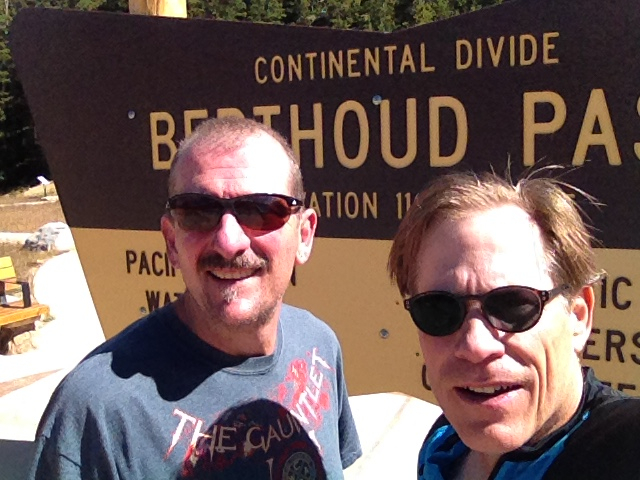 Instead of running 26.2 miles on the Boulder backroads this morning, I ran along the Continental Divide with Keith and Chris in the mountains above Breckenridge. I’m not disappointed now. 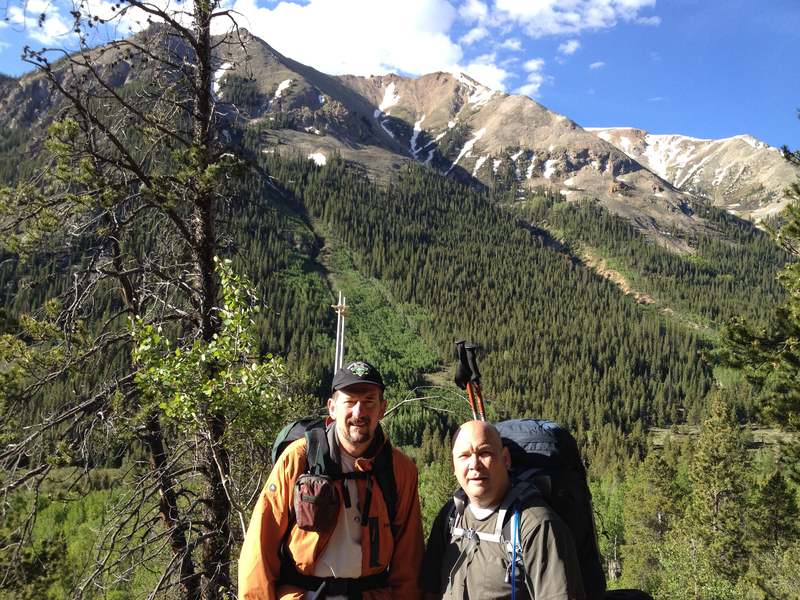 This pic is of us on the pass at 10am with Mount Guyot (pronounced gui-oat) in the background. As of last night, the weather called for rain, turning into snow. Instead, the temperature was 41° and the rain didn’t begin to fall until around 12 or 13 miles. Ideal running weather. 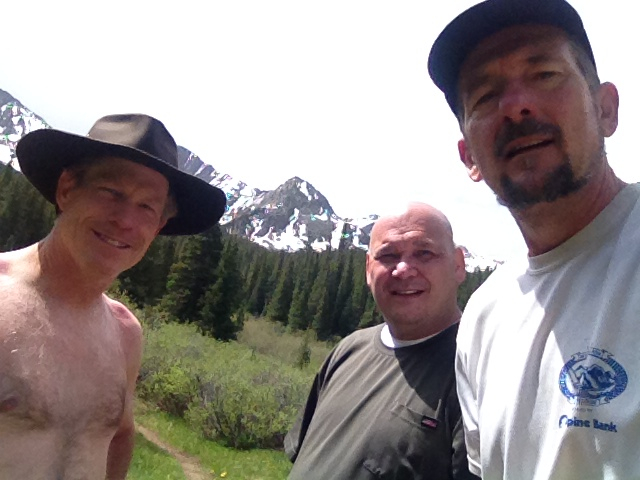 The three of us were comfortable wearing runner shorts and 2 or 3 layers of shirts. As you can imagine, there were very few others out on the trail. 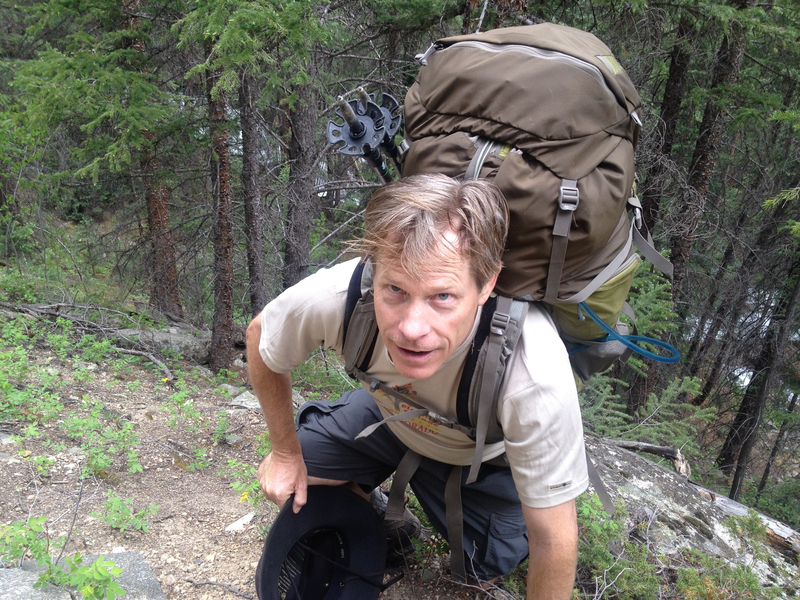 We encountered one hiker who started ahead of us, with his dog, and a couple more on the descent. Plus four mountain bikers crossing the trail on a jeep road. 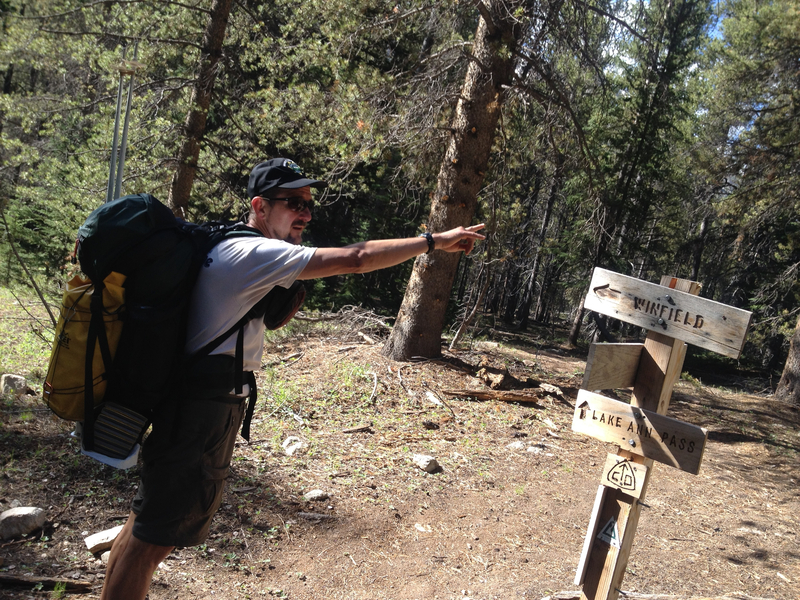 We reached the trailhead via Tiger Road, which runs east from Hwy 9. After 5 or 6 miles, we took the left fork to the North Fork Swan River. The right fork leads to the trailhead on the Middle Fork Swan River, but it would have been a shorter run than we wanted. We were looking to run about 13 miles. The Middle Fork would have been 10 miles. The North Fork turned out to be 16 miles – out and back. 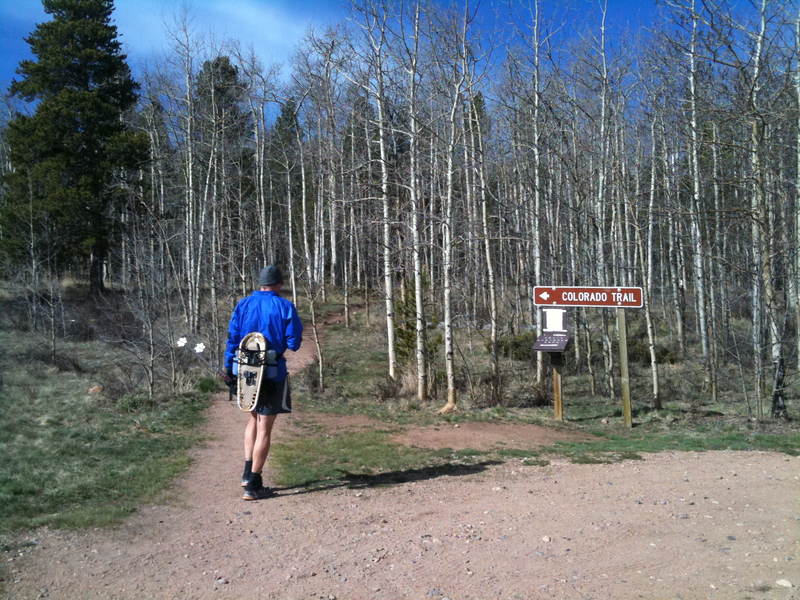 The trail is segment 6 of the Colorado Trail. 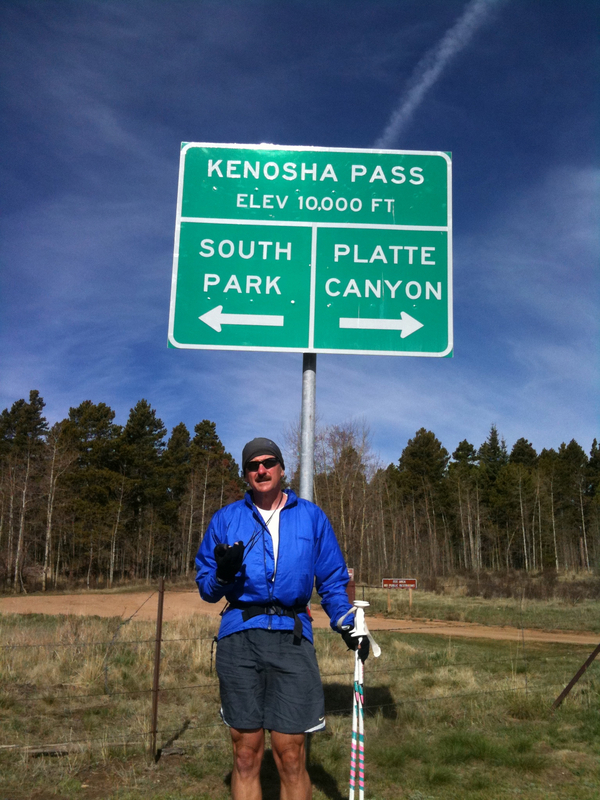 This entire CT segment is 31 miles from Kenosha Pass on Hwy 285 to Gold Hill on Hwy 9. This section of trail isn’t as smooth as the other sections between here and Denver, but the 6% grade was manageable, considering we were running up to the Continental Divide. 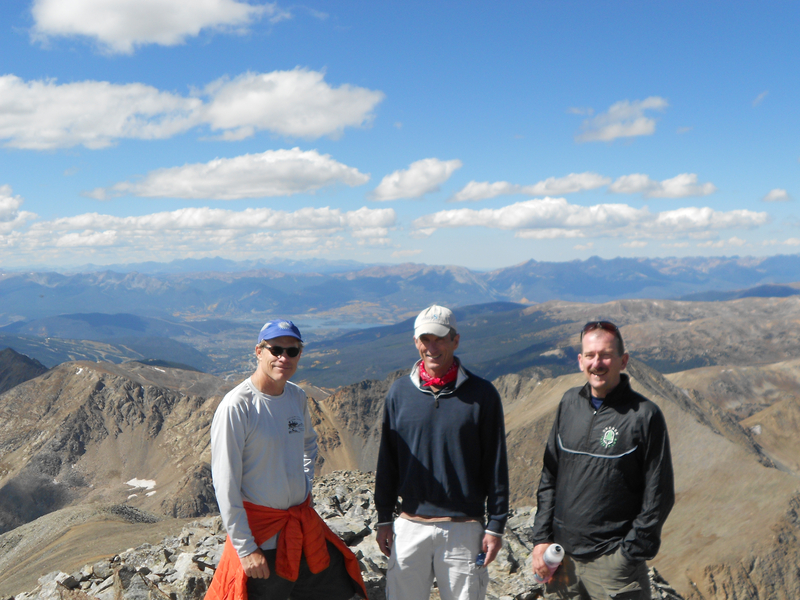 We started just under 10,000 feet and the Pass sits close to 12,000 feet. Trail shoes are advisable given some of the rocks, and the rain making it slick, but both Chris and Keith navigated fine in street running shoes. I was pleased we were able to run up with very little walking. 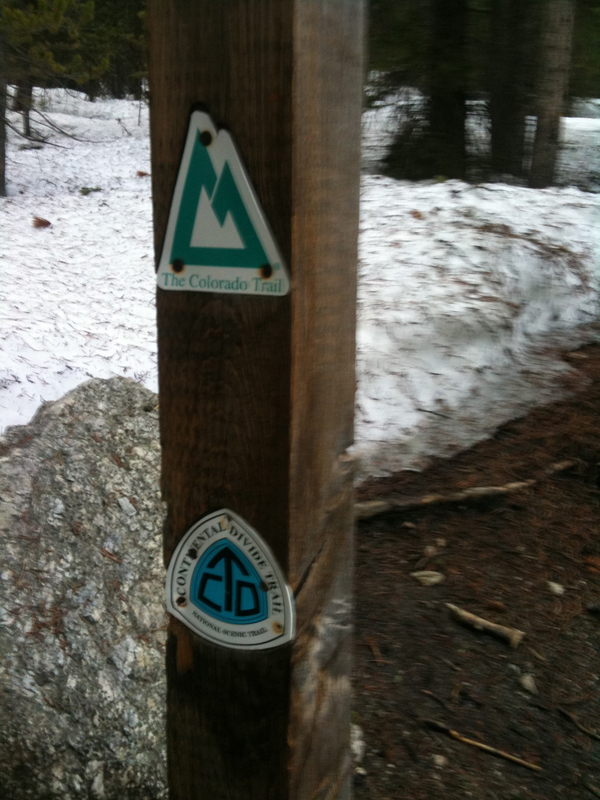 The first 3 miles between the North and Middle Fork trailheads served as a pleasant warmup. The grade steepened after that. Chris seemed unaffected, although he slowed down at times for Keith and me. 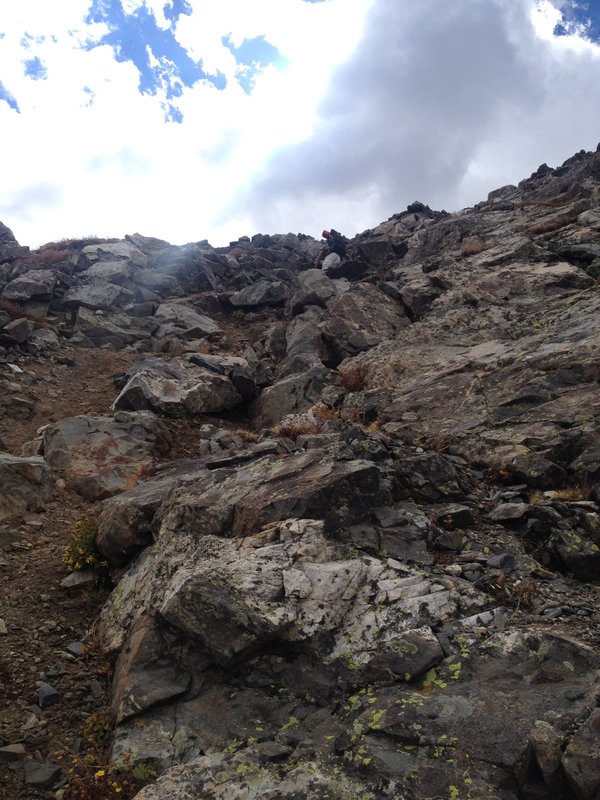 The pass appeared as soon as we rose above treeline. I was more exhausted than I expected; I assume from not walking more on the ascent. We decided to all return at our own paces. Keith wanted to be cautious. 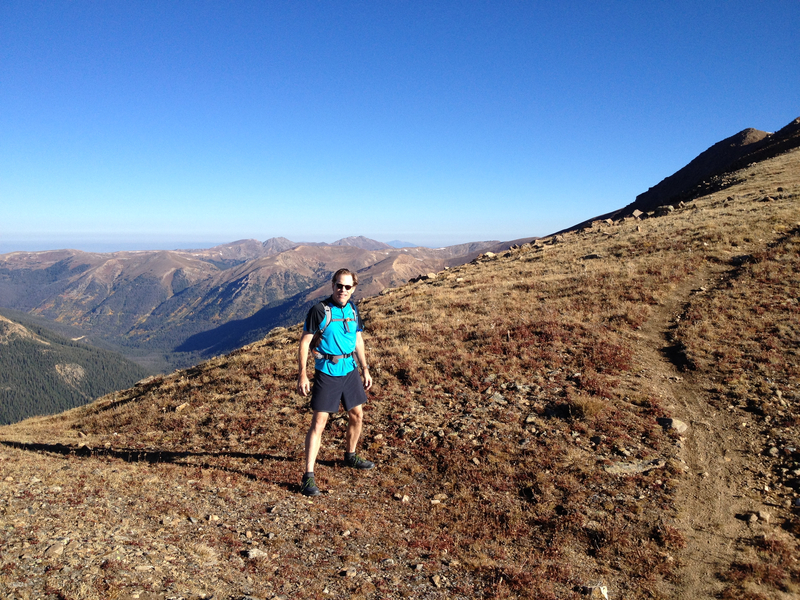 I wanted to run fast but knew I was too exhausted to keep up with Chris – who wanted to sprint the 8 mile descent. He nearly did. This picture – which you might need to click on in order to see Chris – shows him 100 yards ahead of us after only 30 seconds. 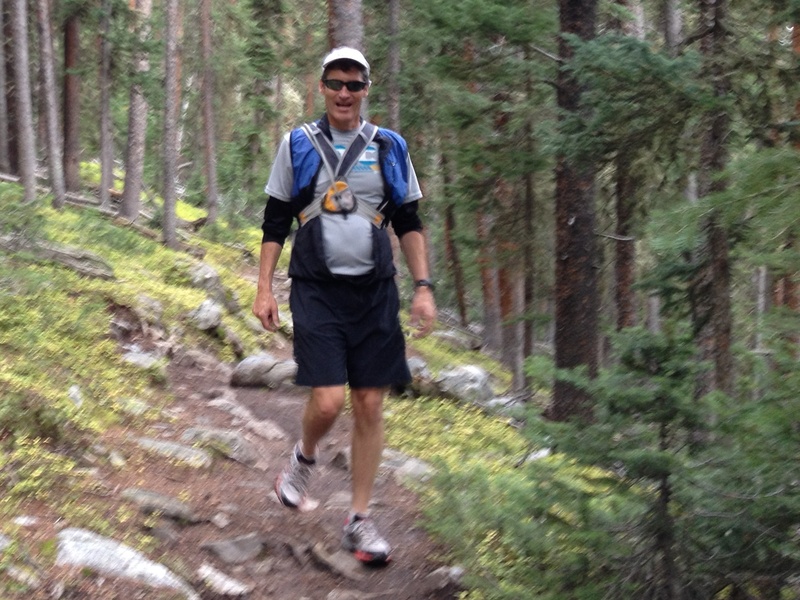 Chris reached the trailhead about 20 minutes ahead of me, giving him a 3 hour, 16 mile run. He out-ran me on the return by about 2.5 minutes per mile. I was hoping to keep up with him on the cancelled marathon. That might have been wishful thinking. 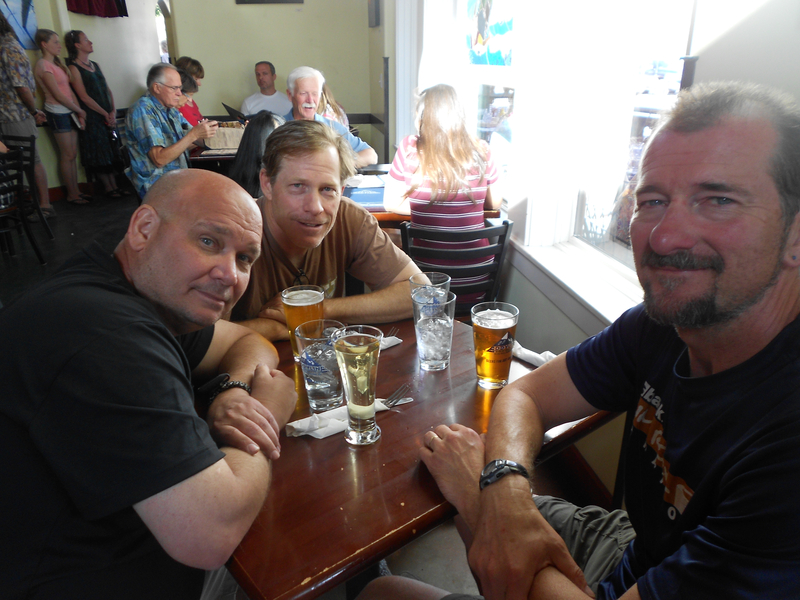 With Chris as our driver, Keith and I enjoyed a few ales at the Dam Brewery in Dillon. Their pub fare is really good. My cheese burger was outstanding – served to order. Could be I was just really hungry – my Garmin suggests I lost 1900 calories. I’m still working on overcoming that deficit, having eaten dinner and thinking of lemon meringue pie. The rain followed us back to Boulder County. Hopefully nothing dramatic. My running is now largely on streets which I hate. The trails are slowly opening but not enough yet. 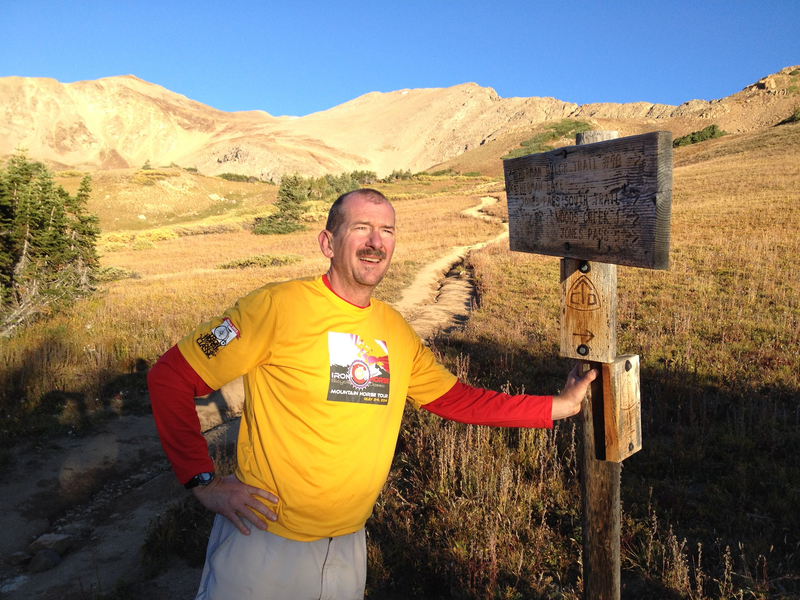 I’m debating whether I should run the Denver Marathon in October. That’s on streets. Might be a good match for my current training.